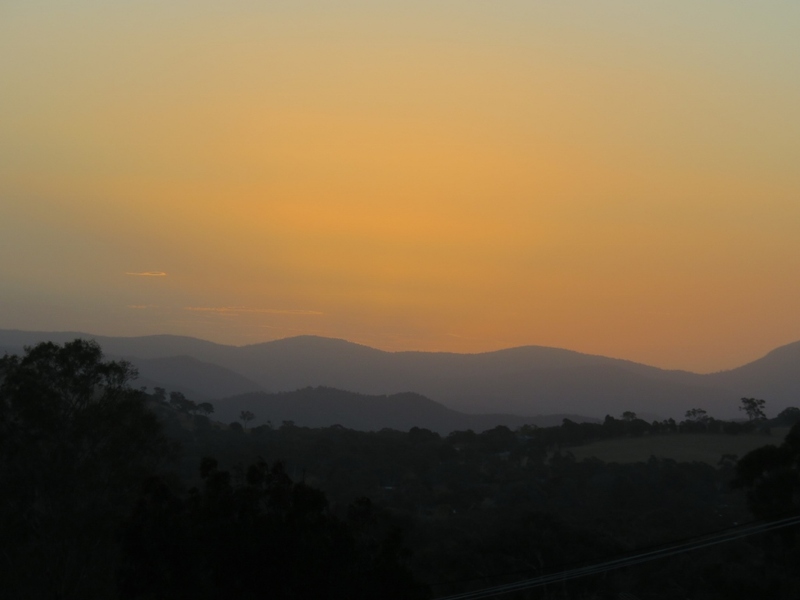 Australia Day…and seeking the sunshine..
….the good news is…… there’s still a lot of sunshine out there! 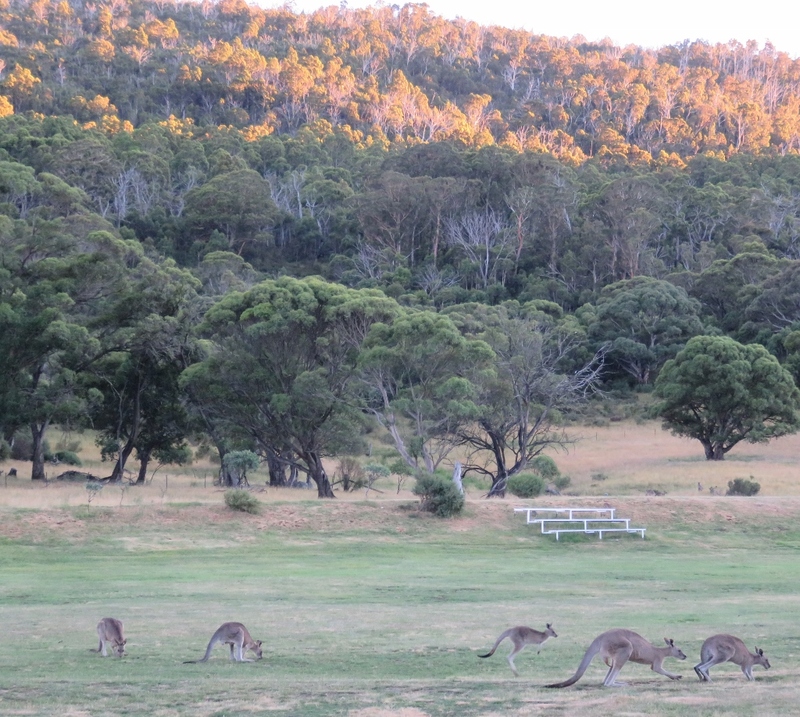 Although it is reasonable and important to have debate for change in a democracy….. let’s not forget all the reasons for loving Australia, or where ever you live in the world.. 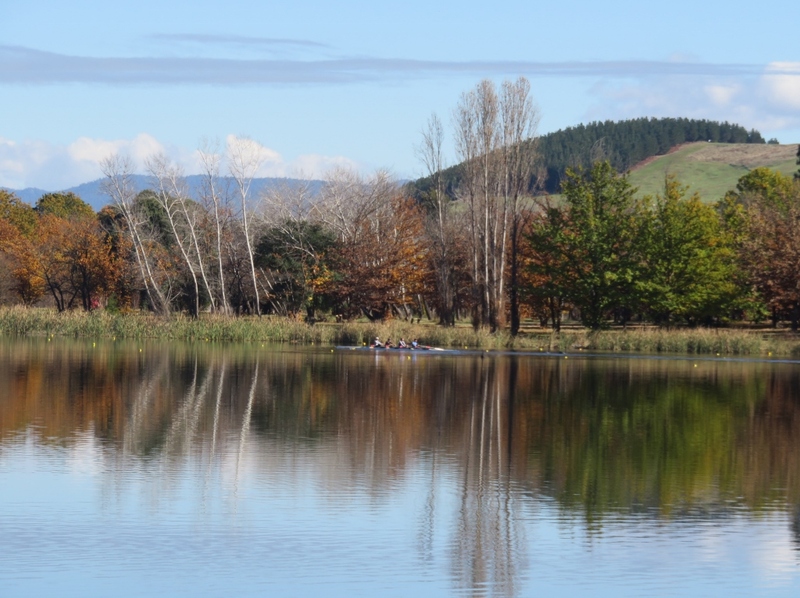 Here are some of my reasons for loving where I live…. 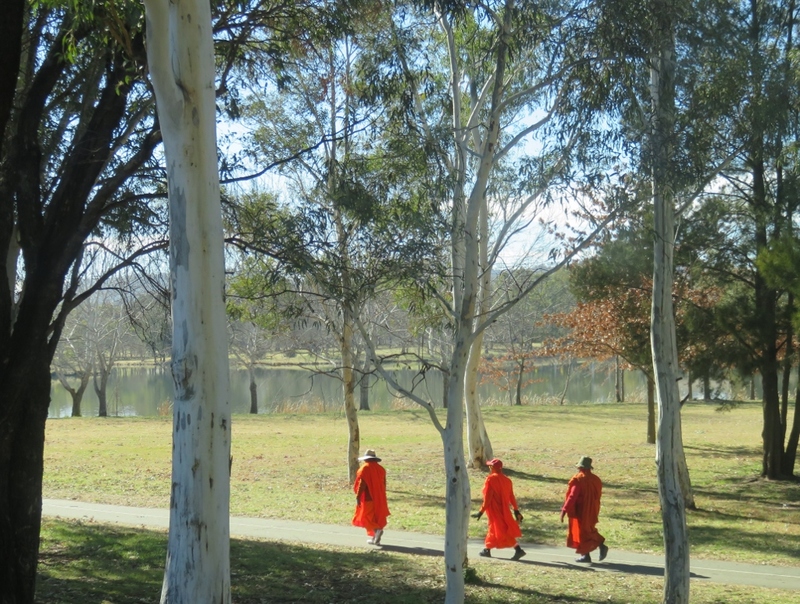 The National Library of Australia and a small electric boat that cruises around Lake Burley Griffin almost every day..
Lake Tuggeranong on a very cold winter’s day for these Buddhist monks from a nearby temple. 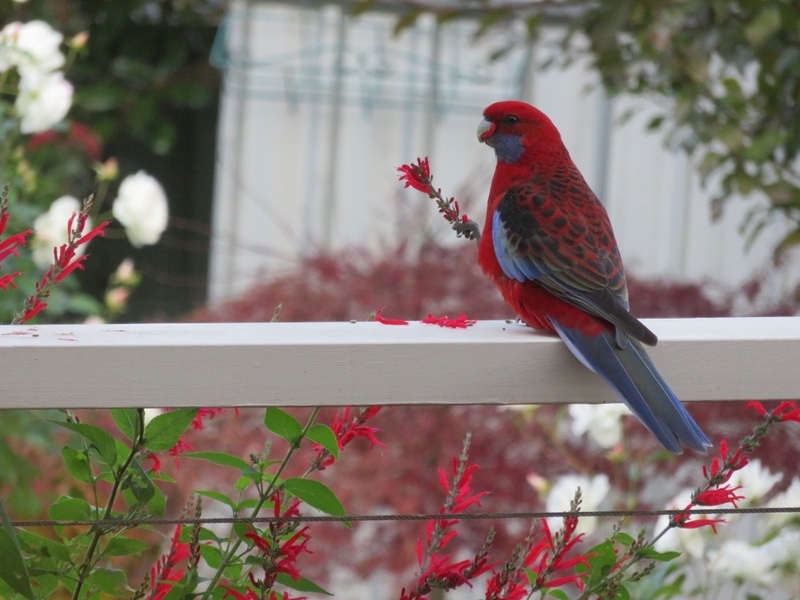 A Crimson Rosella eating Peppermint Sage on our deck on an autumn morning..
a golden wattle flower, the floral emblem of Australia. 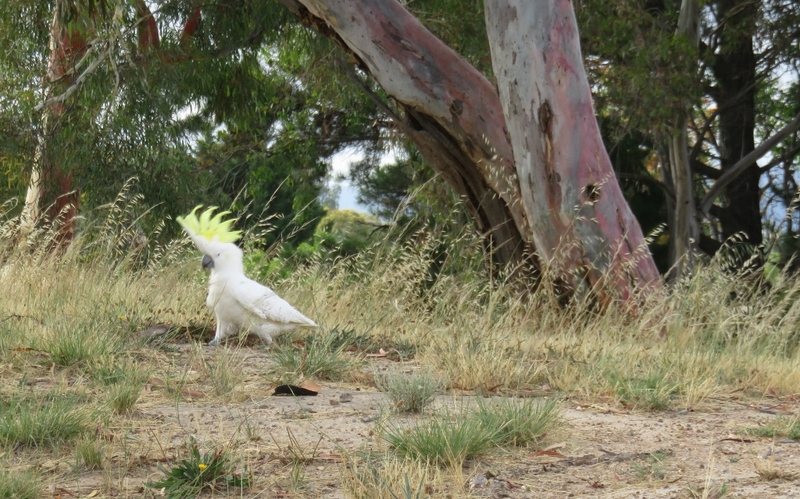 A Sulphur Crested Cockatoo on his way to Mount Taylor, near where I live.. 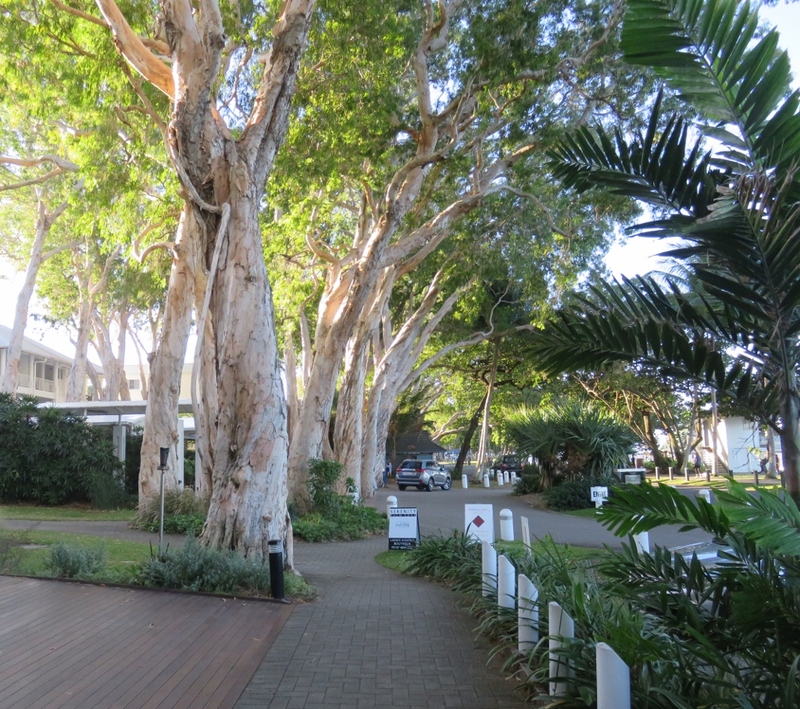 Holidays amongst the Melaleuca trees in Palm Cove, North Queensland. 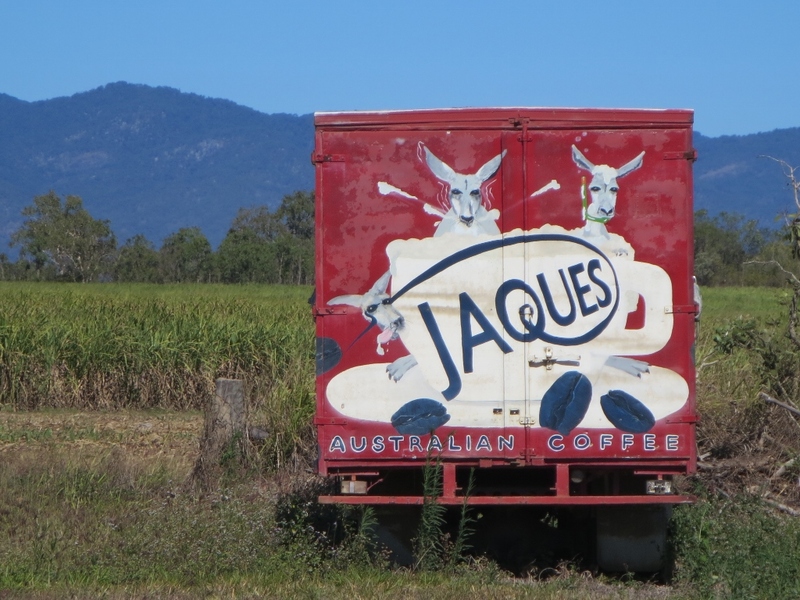 The Atherton Tablelands in Far North Queensland, with the best food and coffee in the state, thanks to a multicultural community. 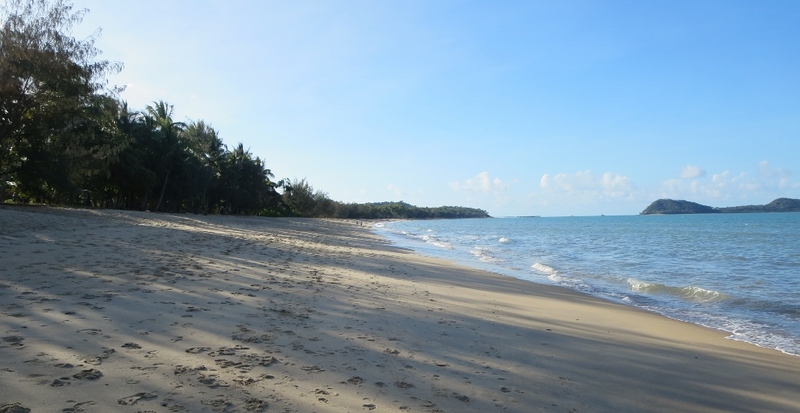 Palm Cove, Far North Queensland….what can I say? ‘“with all its sham, drudgery and broken dreams, it is still a beautiful world. 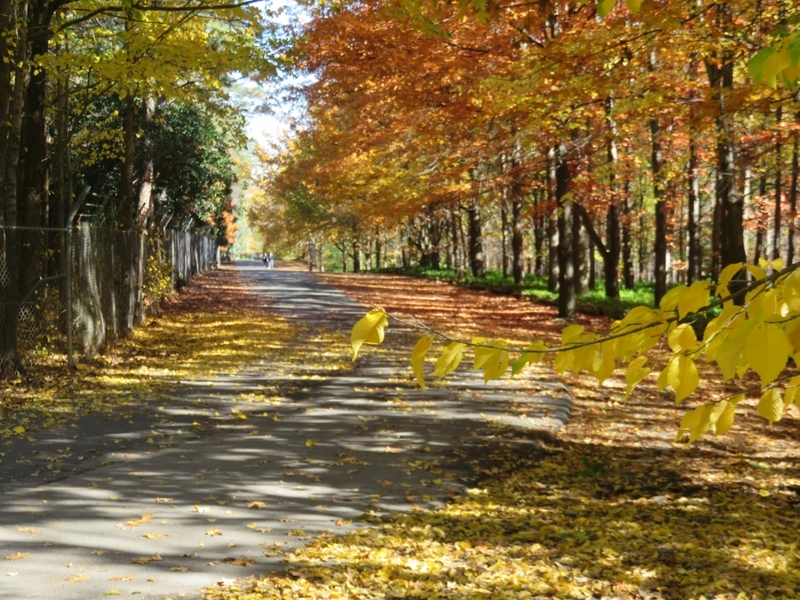 Do you have a favourite place in your part of the world? 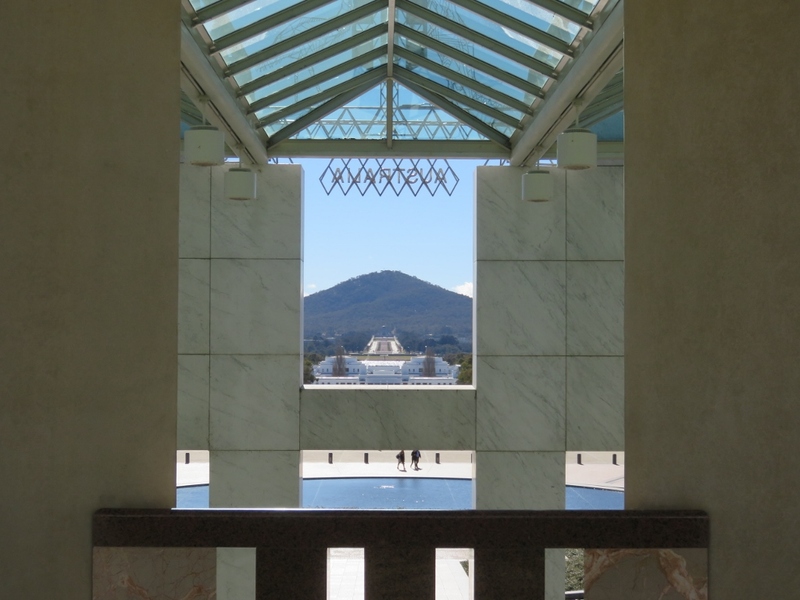 This entry was posted in Canberra's Public Gardens and tagged Atherton Tablelands, Australia, Australian Parliament House, crimson rosella, Desiderata, Far North Queensland, Gandhi, golden wattle, kangaroos, Lake Crackenback, Lake Tuggeranong, Melaleuca Trees, National Gallery of Australia, National Library of Australia, Palm Cove, Port Douglas, St Mary's by the Sea, Suphur Crested Cockatoo on January 26, 2018 by germac4. 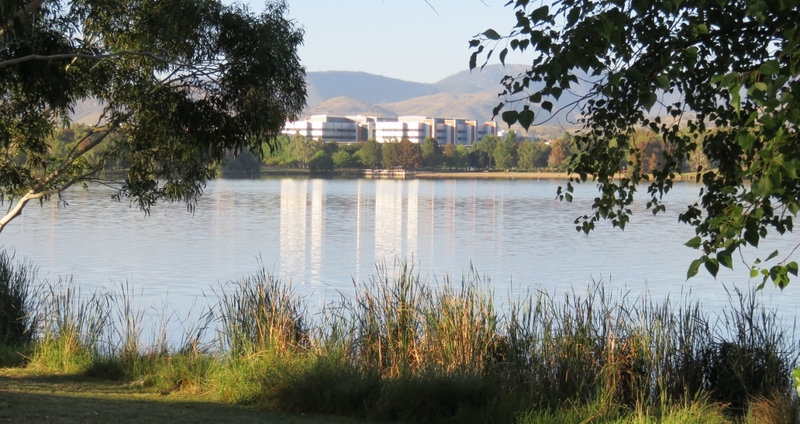 The Australian poet CJ Dennis said… ” spring is near, then suddenly it seems, one golden morn..
A Magpie warbling in the gum tree at Lake Tuggeranong, near our home. 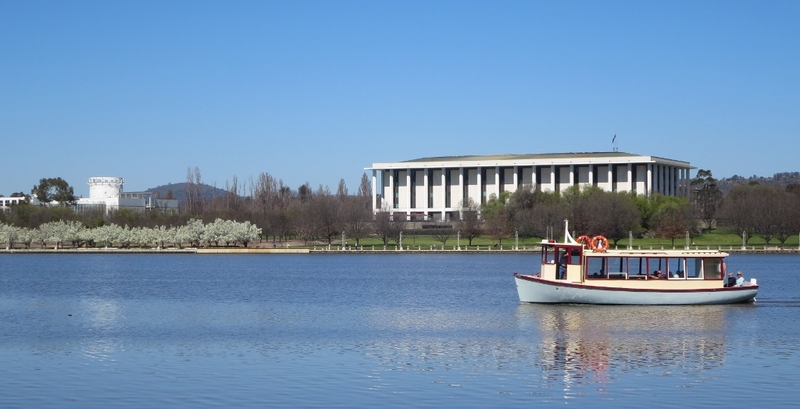 Canberra, unlike many parts of Australia, has four distinct seasons, and spring is welcomed here the way it would be in the Northern Hemisphere. 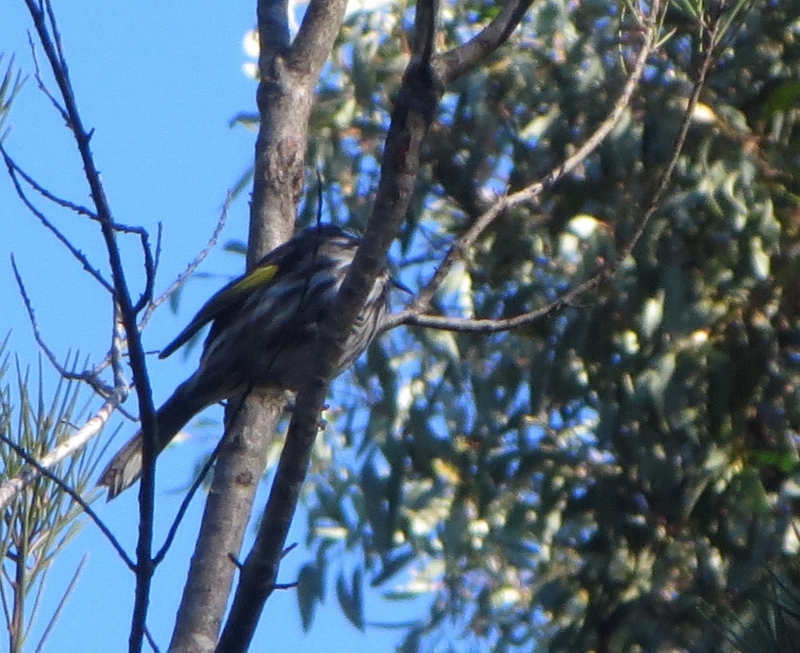 Canberrans hear many different bird calls in spring, but none so earth shattering at 5.30 in the morning as the Kookaburra’s cackle…. 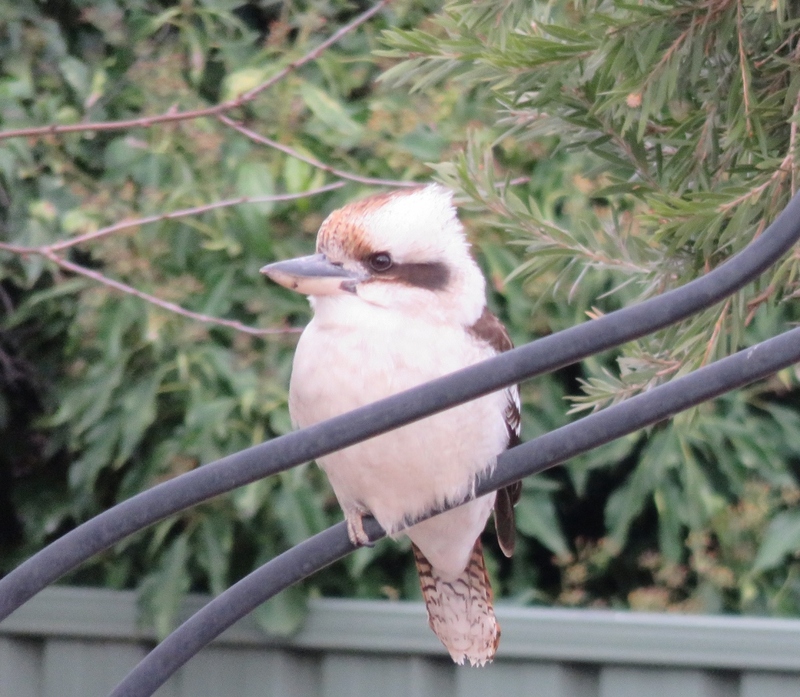 Every spring one or two young Kookaburras arrive in our garden. 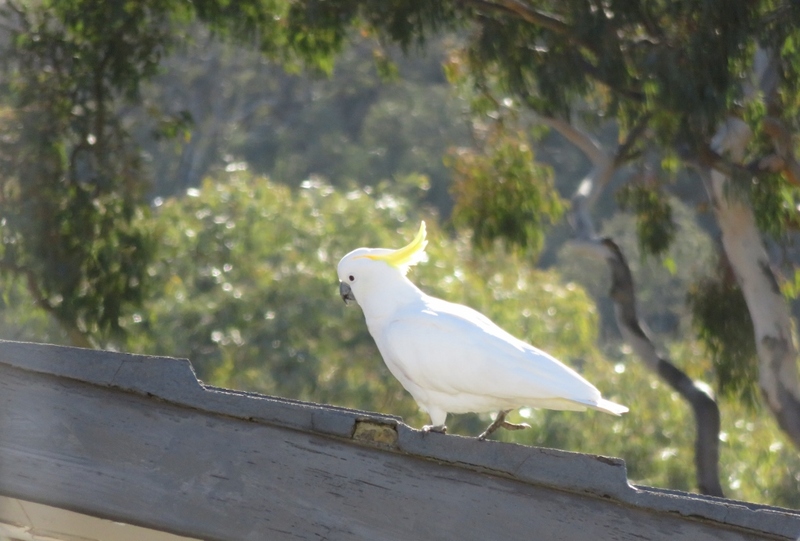 I like to think they come because we have plenty of water, and they are relatively safe for flying lessons between the garden arches and the overhead electrical wires. 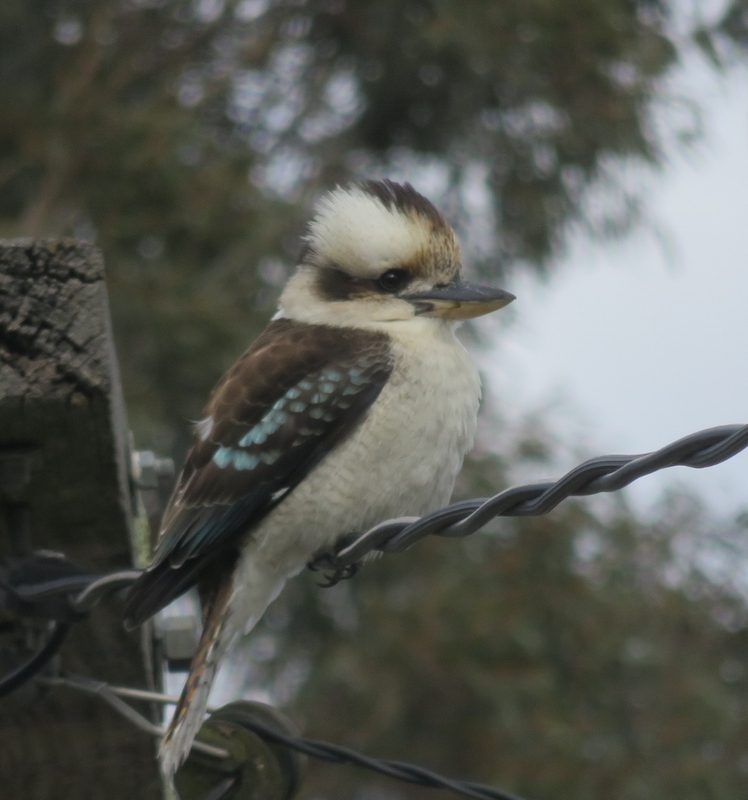 We call this young Kookaburra the Minister for Transport… he looks so important doesn’t he? 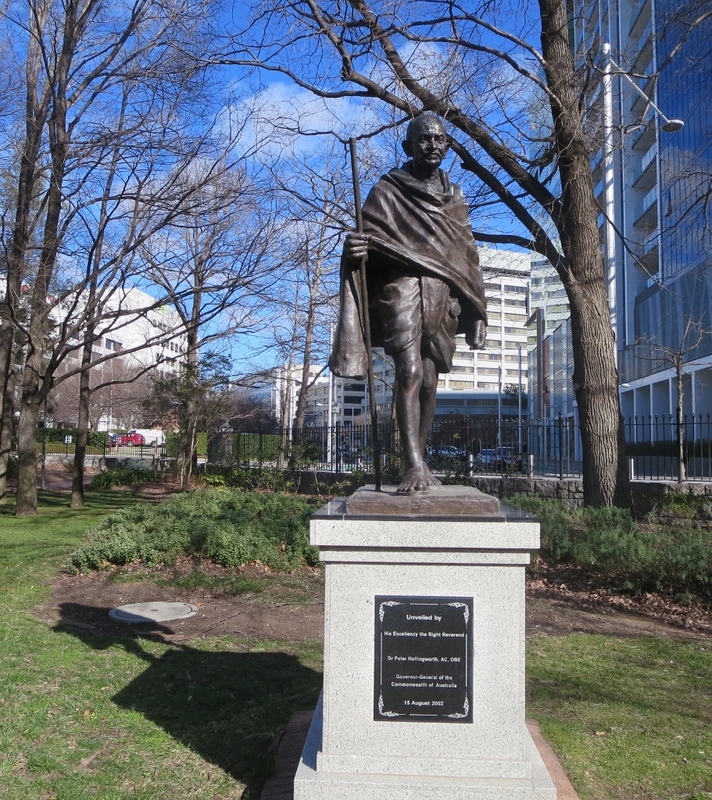 …..and he’s in the right city! 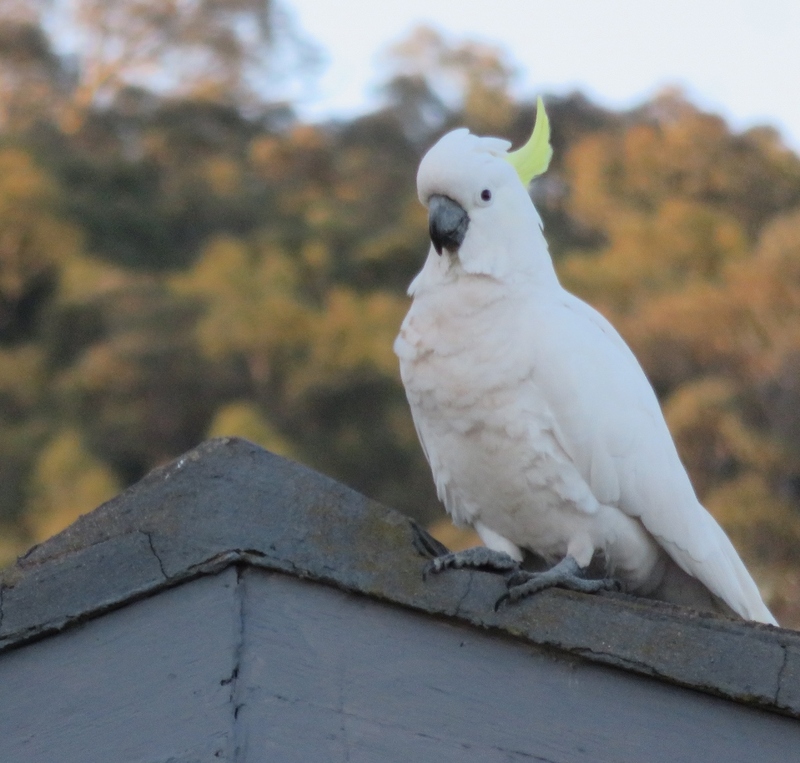 Meanwhile… the ”Town Crier”‘ is marching up to the top of the neighbour’s roof..
….and does she know about me yet? 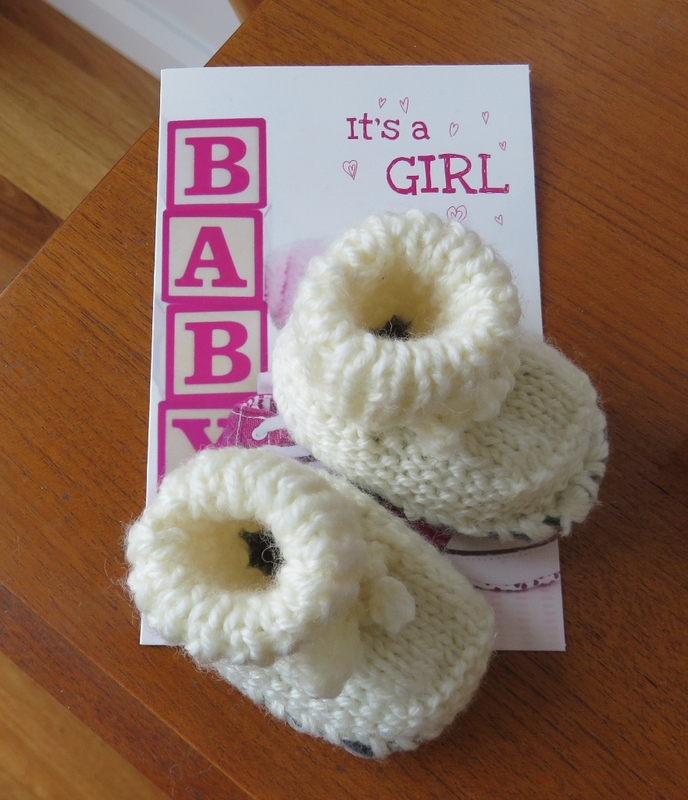 Our first grandchild has arrived safe and sound, and….. she is absolutely lovely in every way..
“‘Being a parent is like being a slightly bewildered NGO in the trenches, with fear of consequences all around.. 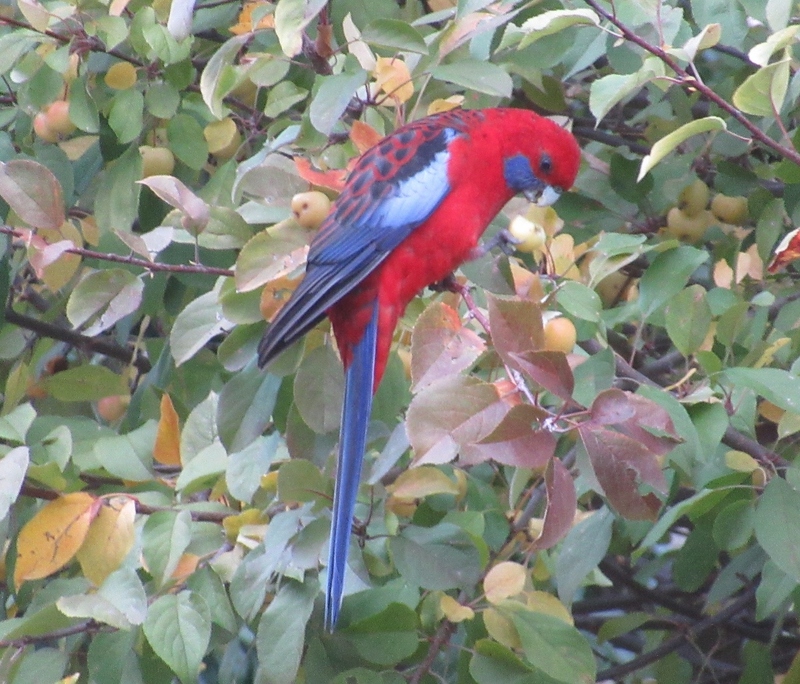 This entry was posted in Canberra's Public Gardens, Canberra's Suburban Gardens, Wildlife in the suburbs and tagged Australia, Banksia, birdbaths, Canberra cockatoos Brindabella Mountains spring, CJ Dennis, crimson rosellas, King Parrots, Kookaburras, National Botanic Gardens, plum trees, Thomas Keneally on September 16, 2017 by germac4. 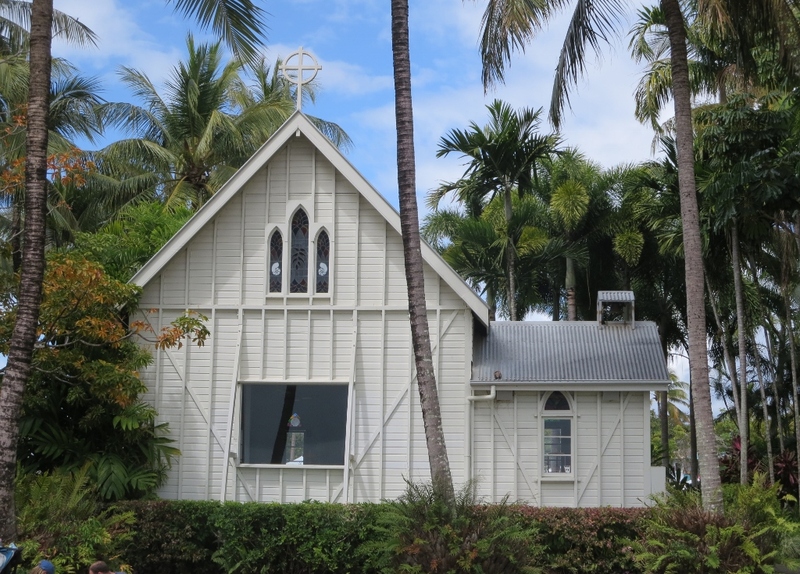 In my case, this article evoked memories from a long time ago, and a long way from home. 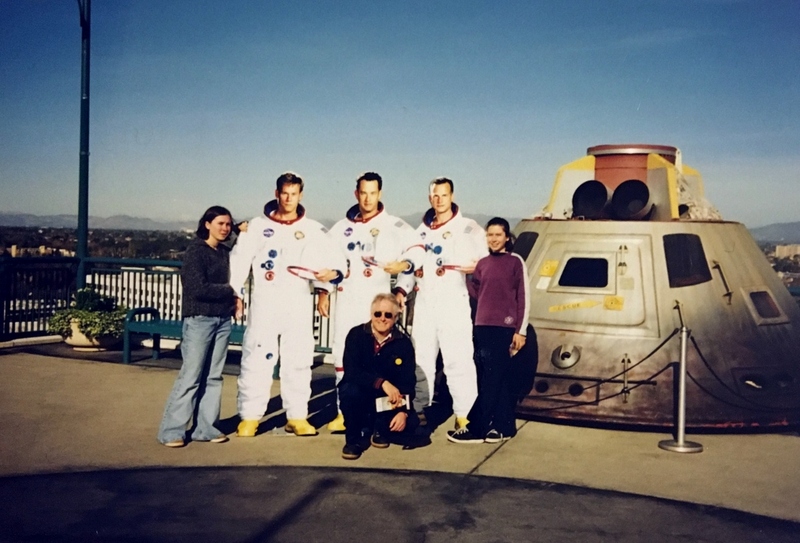 On a cool Californian day in 1999 we were visiting Universal Studios in Los Angeles. While we stopped off for coffee I noticed the Garden section of the LA Times … and Paul kindly suggested I sit down and read it while they tried another ride. ( sounded like heaven to me). 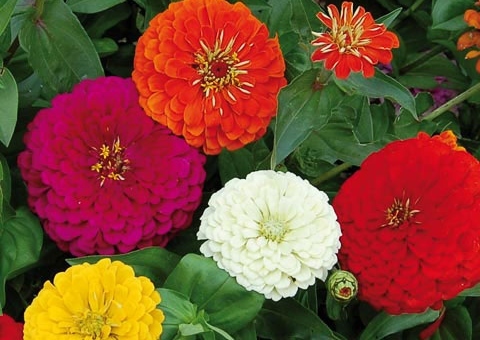 I wanted to read about Zinnias … yes in the middle of Universal Studios .. because they were one of my mother’s favourite flowers and she grew them in the front garden of our house in Zambia ( Central Africa) when I was growing up. In truth I don’t know whether they were her favourites because she grew lots of flowers and always successfully. …and that is just how I remember them. 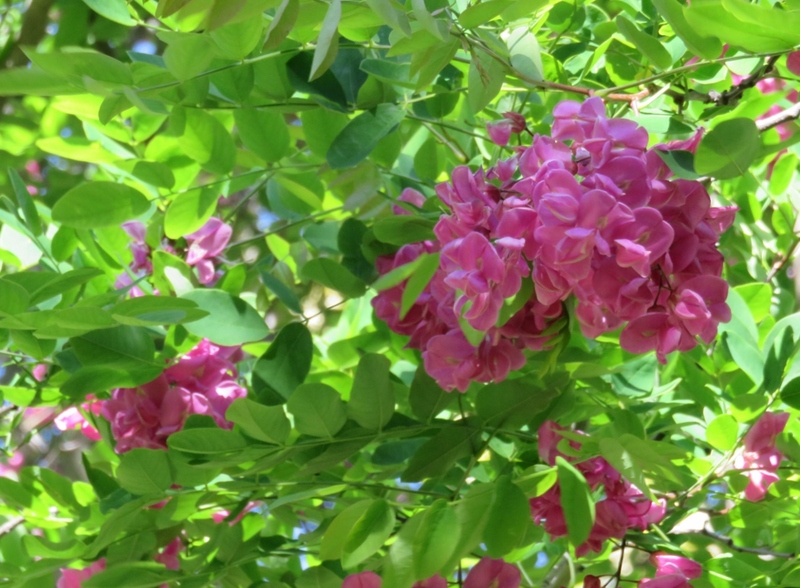 In our Zambian garden they provided a lot of colour in a climate that was hot and dry. At the time of reading that article in Los Angeles my family had long since left Africa and had emigrated to Australia. 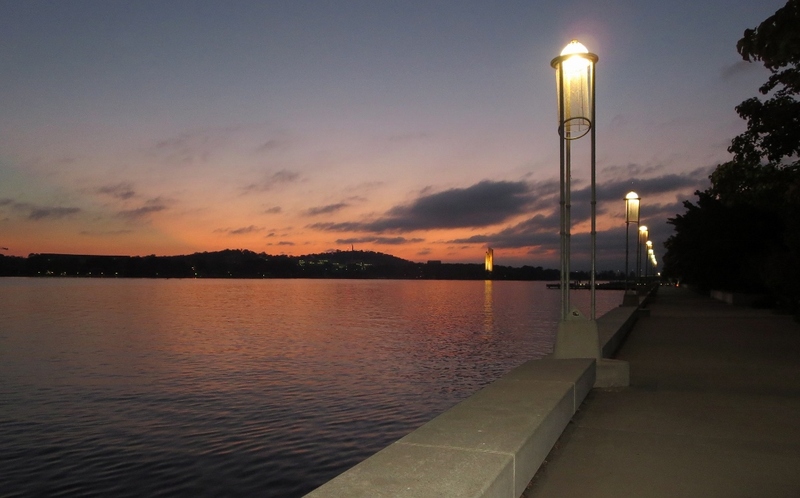 My parents were living in the pretty coastal town of Port Macquarie. 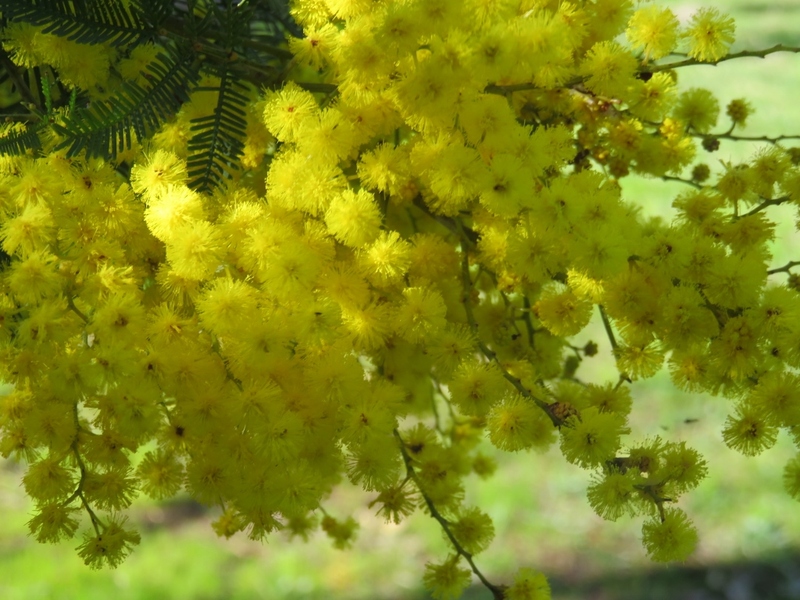 I was transported from my coffee table in the winter sunshine at Universal Studios in LA across Australia and back to Africa…….How strong the memories of flowers and plants are! 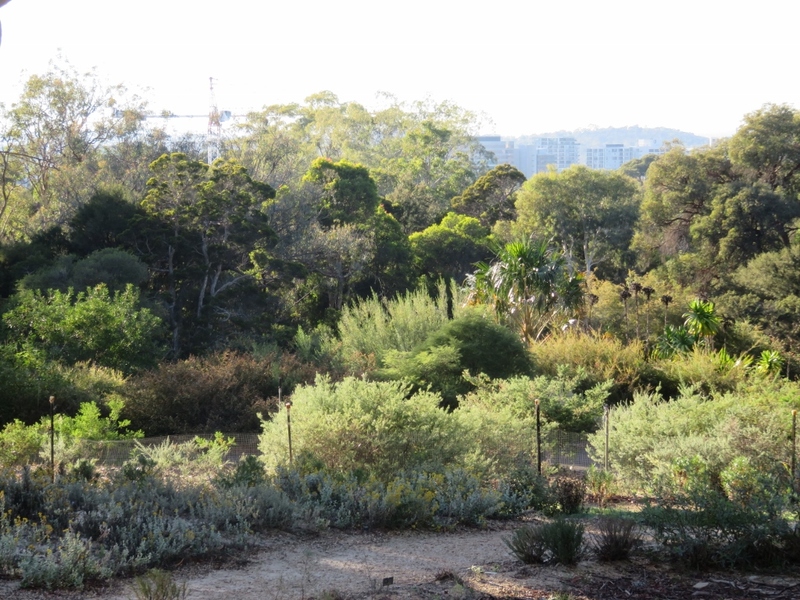 My mother introduced me to many plants and flowers, and when my parents had a home and garden of their own in Port Macquarie I was constantly trying to transplant flowers and shrubs from Mum’s garden in (warm temperate) Port Macquarie to ours in (cold temperate ) Canberra. 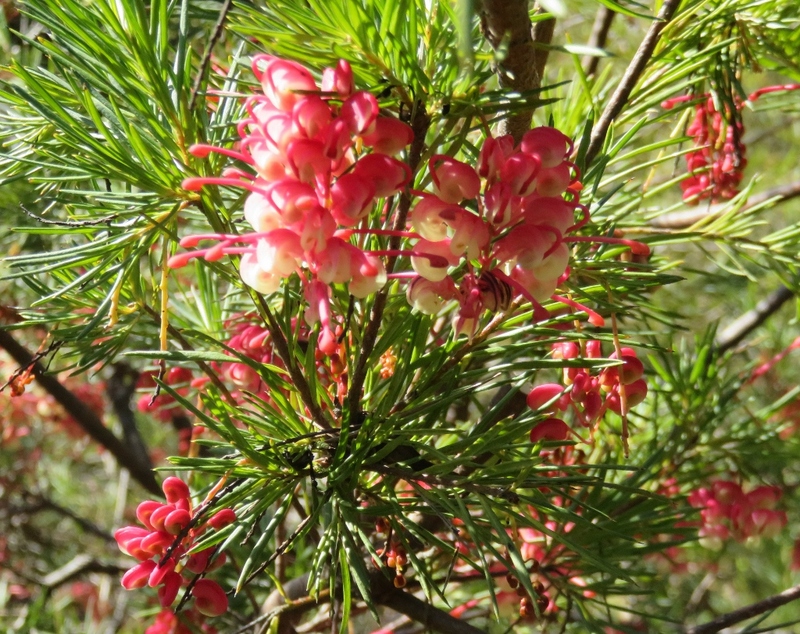 Almost all flowers turned up their toes when they got to Canberra’s freezing/hot dry climate. 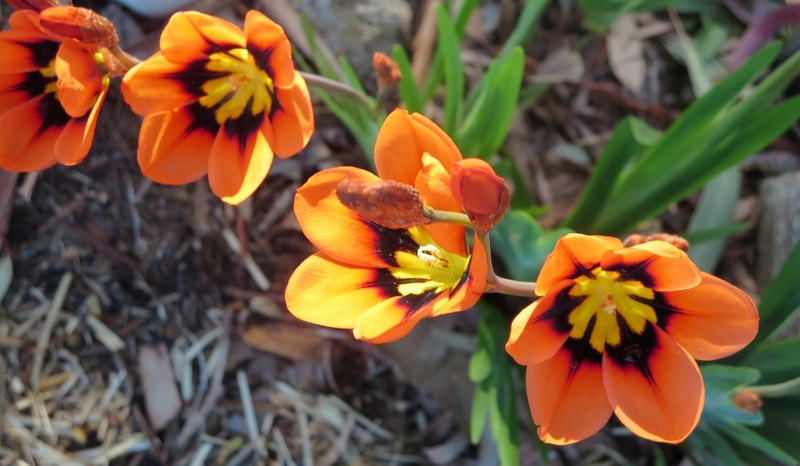 Only a few survived, and they are such a welcome part of spring and summer in our garden. 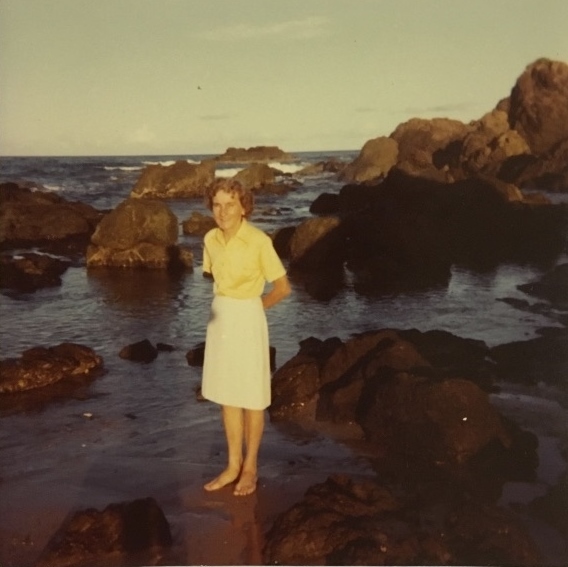 After a full and eventful life, my mother died, not too long after our holiday to the US. 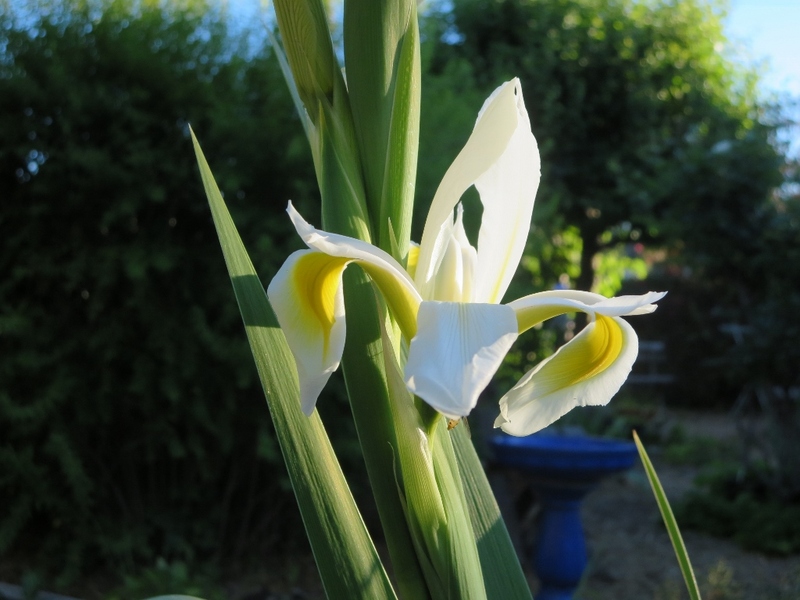 This lovely Dutch Iris (transported from Mum’s garden) was flowering the night she died.. The Dutch Irises have spread and flowered around our garden every November since then…..a warm reminder of our shared love of flowers and gardening. 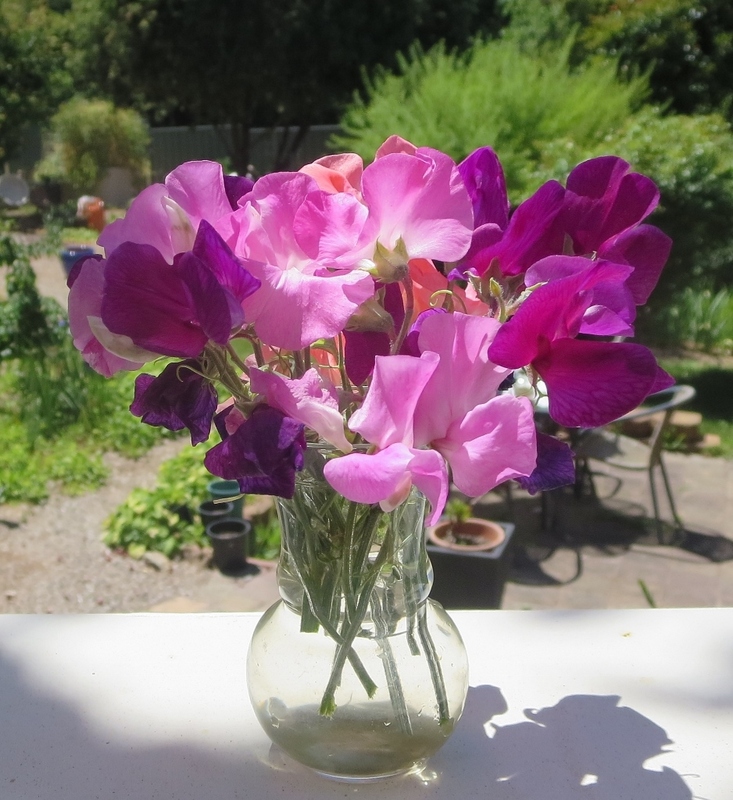 Sweet peas were a big favourite for her and for me, (and they grew just as well for me as for her……Yes!) and the smell is another memory trigger……but who could not love a sweet pea? 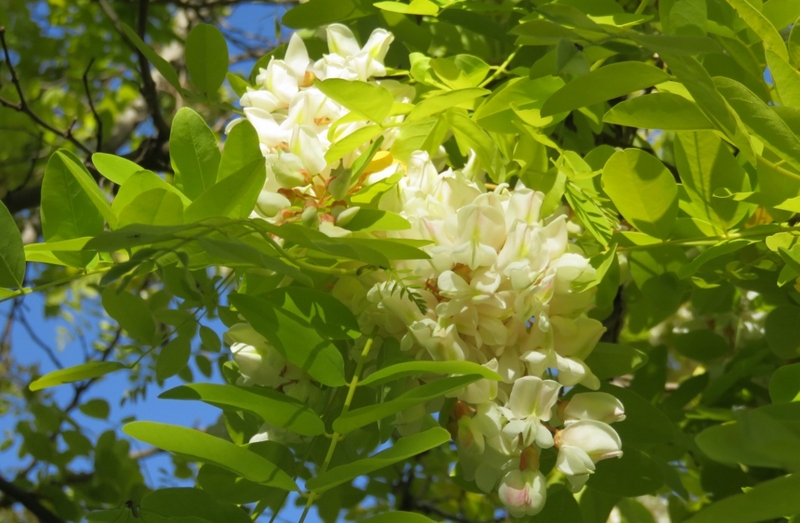 Do you have a flower or shrub or a smell that takes you back to a memory? 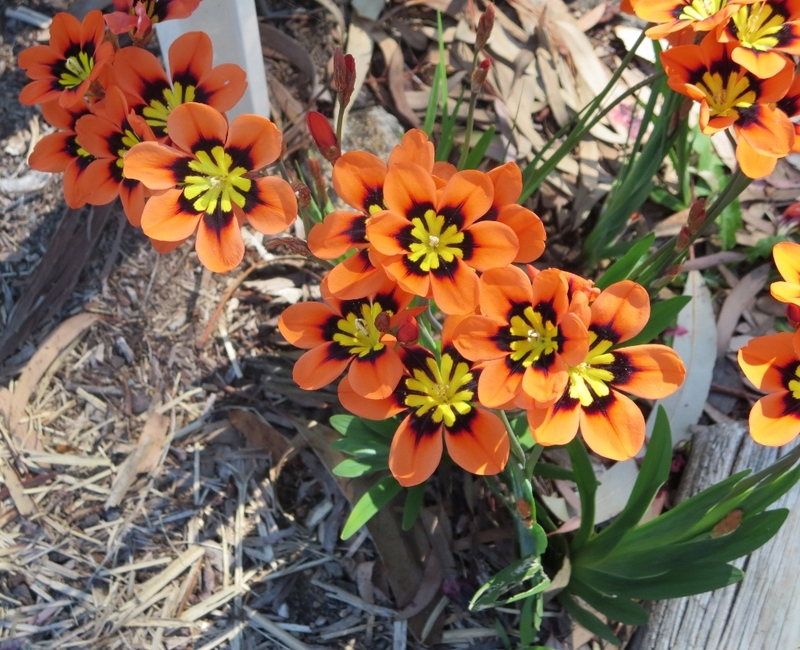 This entry was posted in Canberra's Suburban Gardens, My Place and tagged Australia, Canberra, Dutch Iris, Los Angeles Times, Orange Sparaxis, Port Macquarie, sweet peas, Universal Studios, zinnias on August 11, 2017 by germac4. 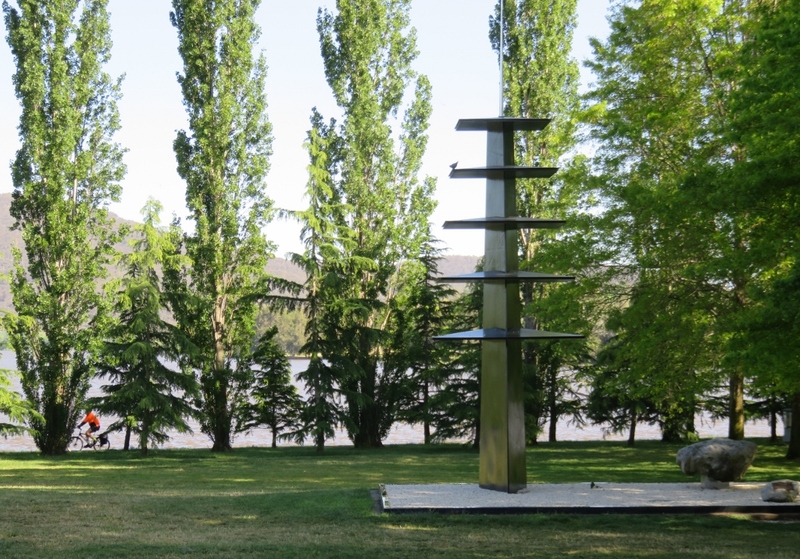 This is the story of Canberra Nara Peace park, celebrating friendship, harmony and trade between Japan and Australia…….and a mighty little bird, the Latham Snipe, that flies between our two countries every year. 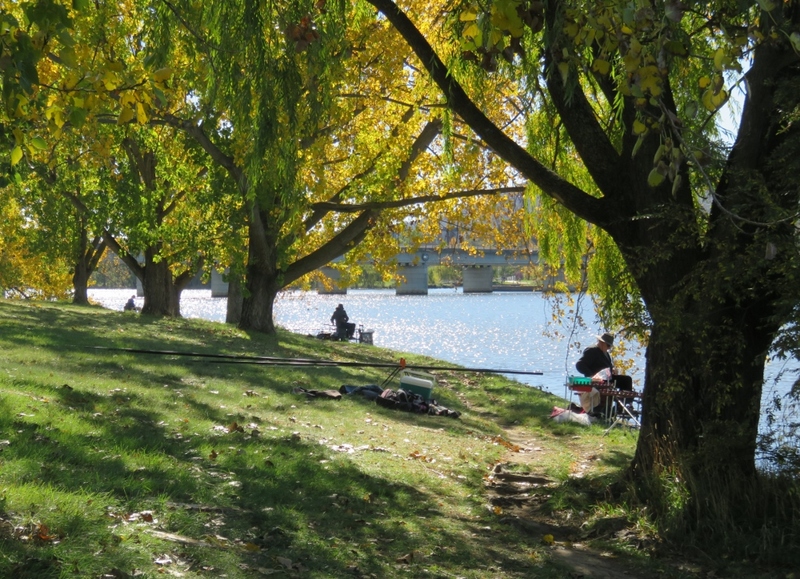 The park is set in the Lennox gardens on the edge of Lake Burley Griffin. 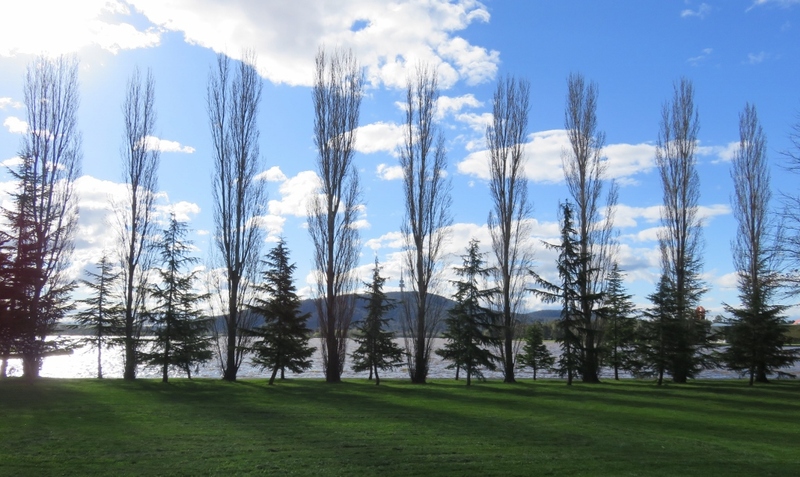 Even at the end of winter there is a stark beauty to the gardens..
Canberra Nara Peace Park opened in 1999, is a symbol of the friendship between the sister cities of Canberra, built as the National Capital of Australia in the 20th century, and Nara, the first capital city of Japan in the 8th century. 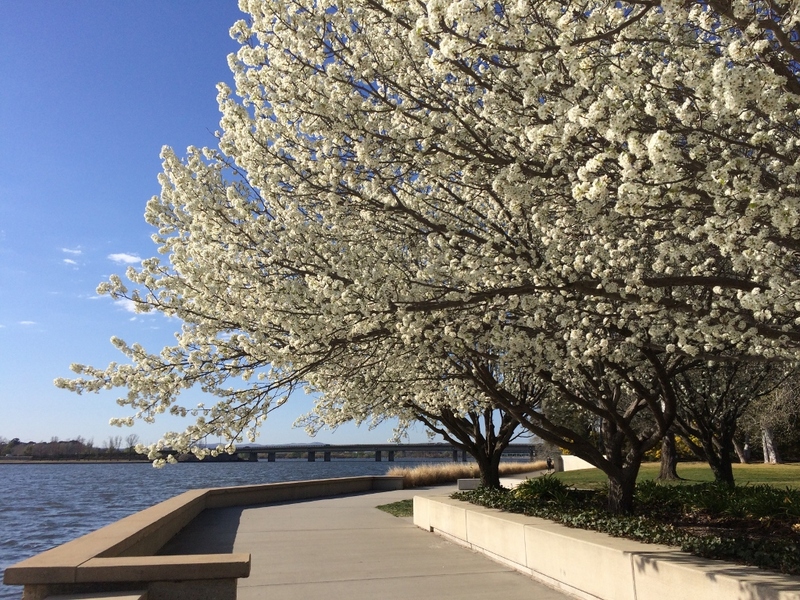 This lovely little park is a joy to visit in any season, but especially in spring. The dry stream bed is lit up once a year for the Nara Candle festival. We missed this wonderful festival this year, so I’ll keep that story for another spring. 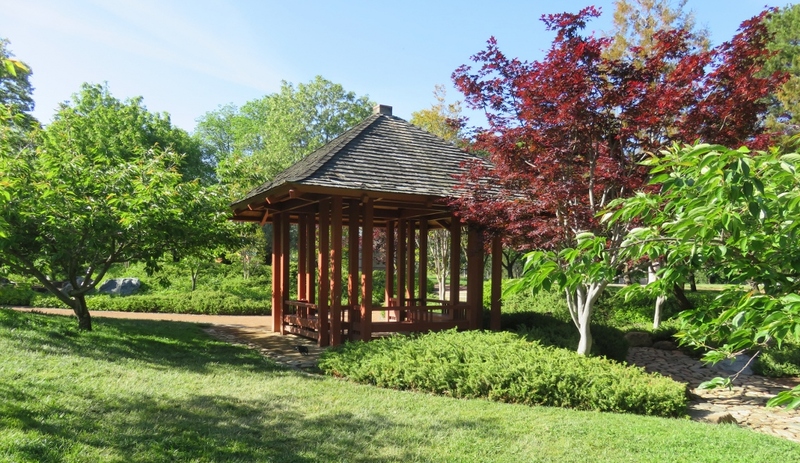 The park has a gazebo surrounded by Japanese maples and cherry trees. 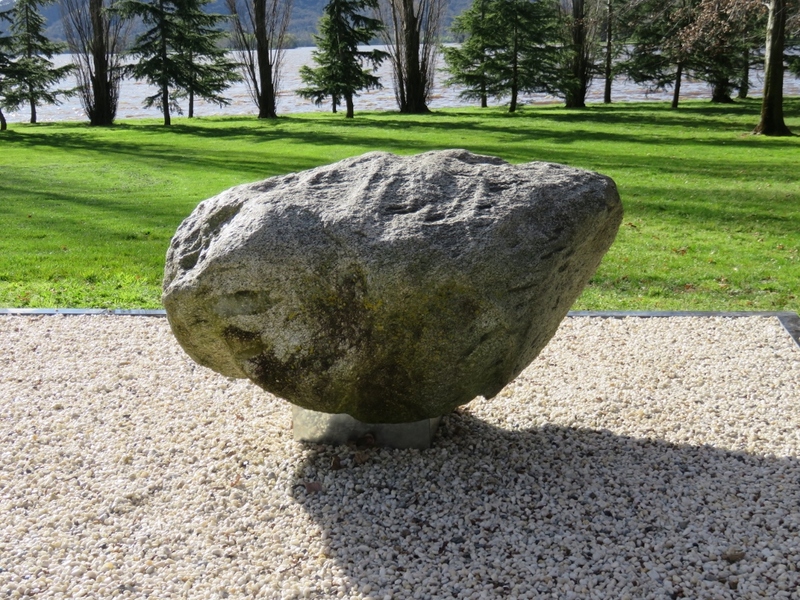 A relatively new addition to the park is a sculpture, Toku, commissioned to celebrate the1300th anniversary of Japan’s ancient city Nara. and the lovely little sculptured bird represents a Latham’s Snipe. 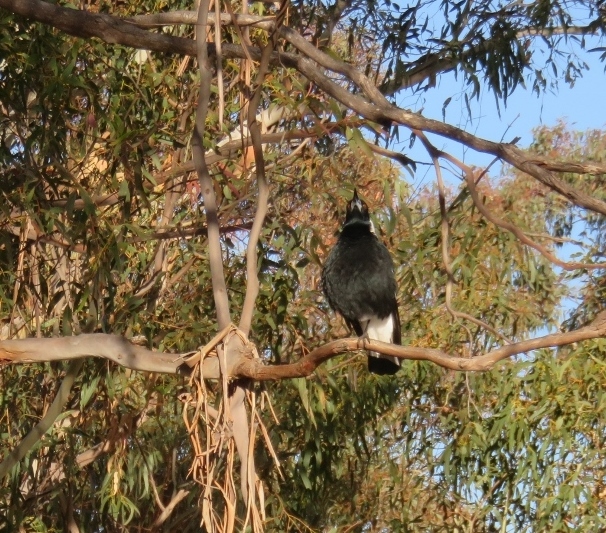 This is a species of shorebird that migrates annually between Japan and Canberra. 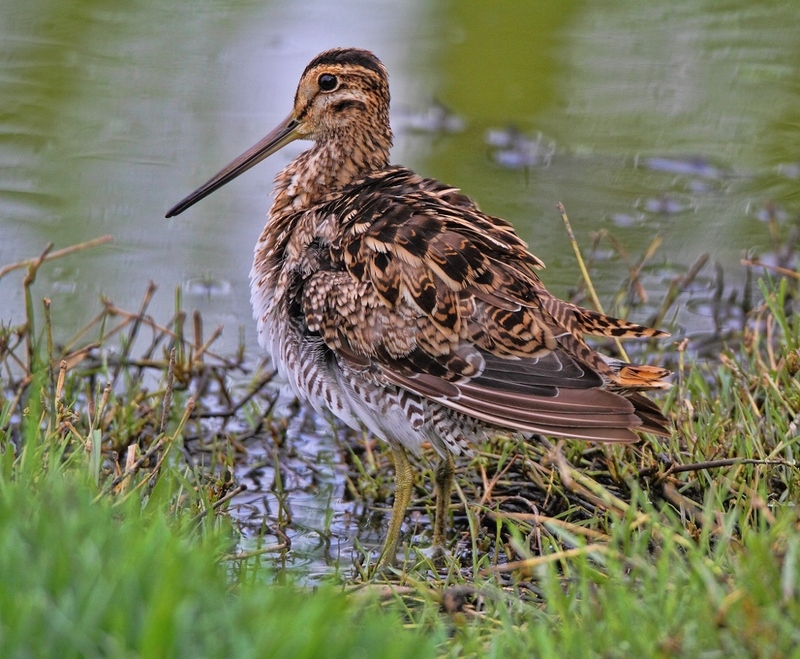 The Latham Snipe, weighing only 200 grams, spends half the year in Japan and then flies south to the warmth of Canberra and other parts of south-east Australia for the spring and summer. 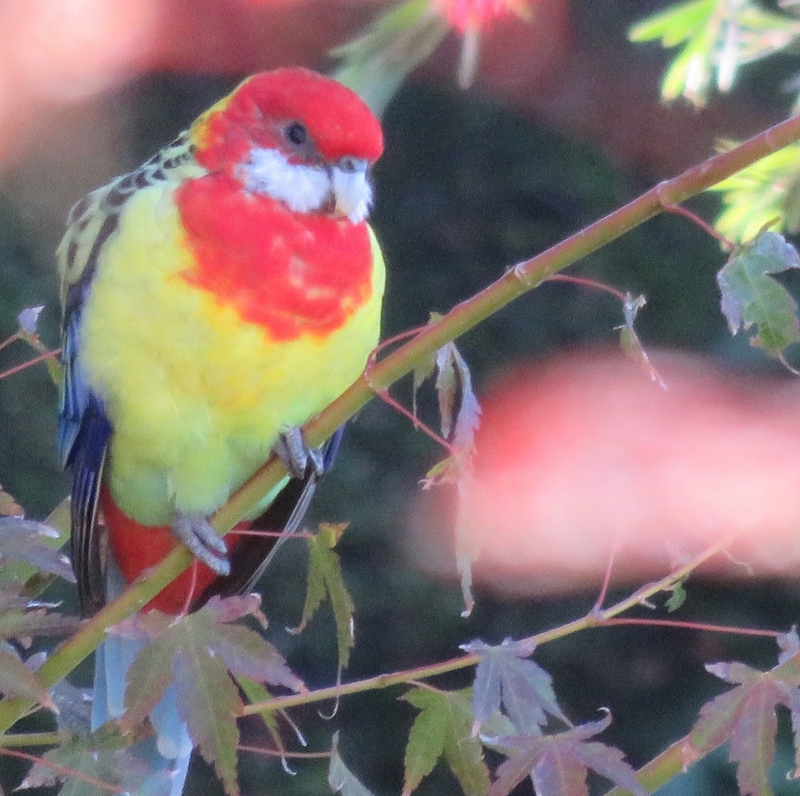 Japan and Australia are working together to find out more about these mighty little birds. On the foreshores of a wetland in Hokkaido in Japan, five birds were skilfully fitted with trackers, before they began their amazing voyage. 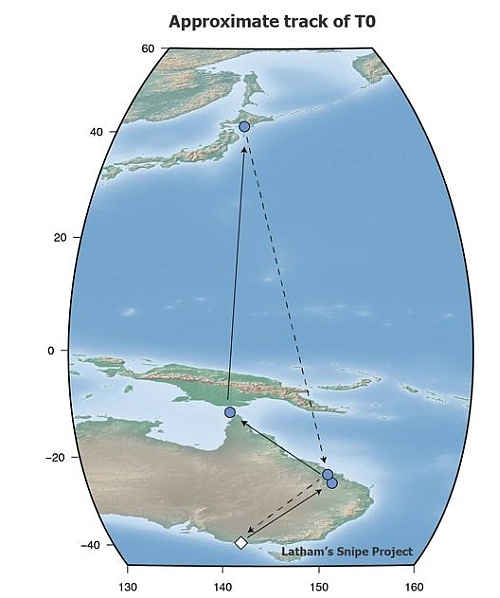 Early data showed the birds travelling more than 5500 kilometres in six days of continuous flight from Hokkaido in Japan to Papua New Guinea at an average speed of 40 km/hr. 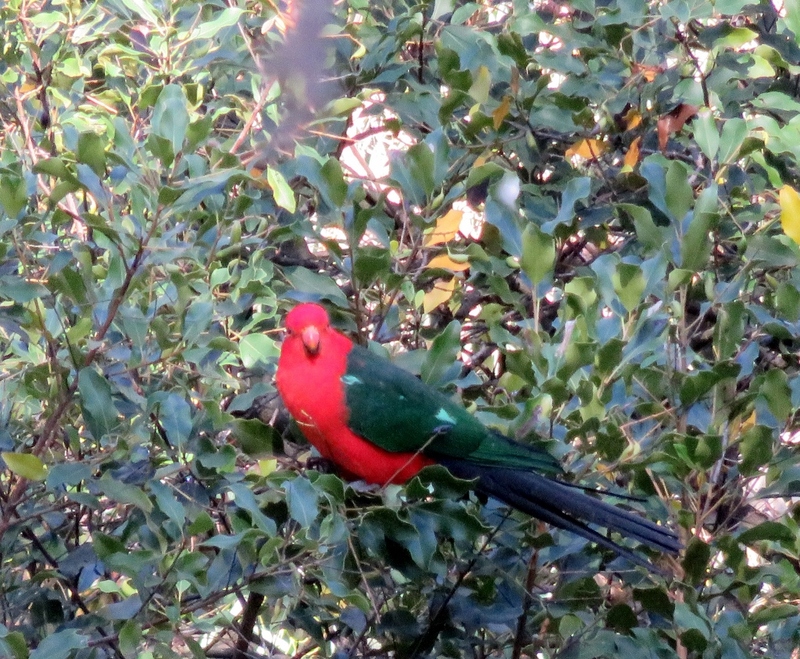 The visiting birds are starting to arrive in the south east of Australia, to settle in for the spring and summer. 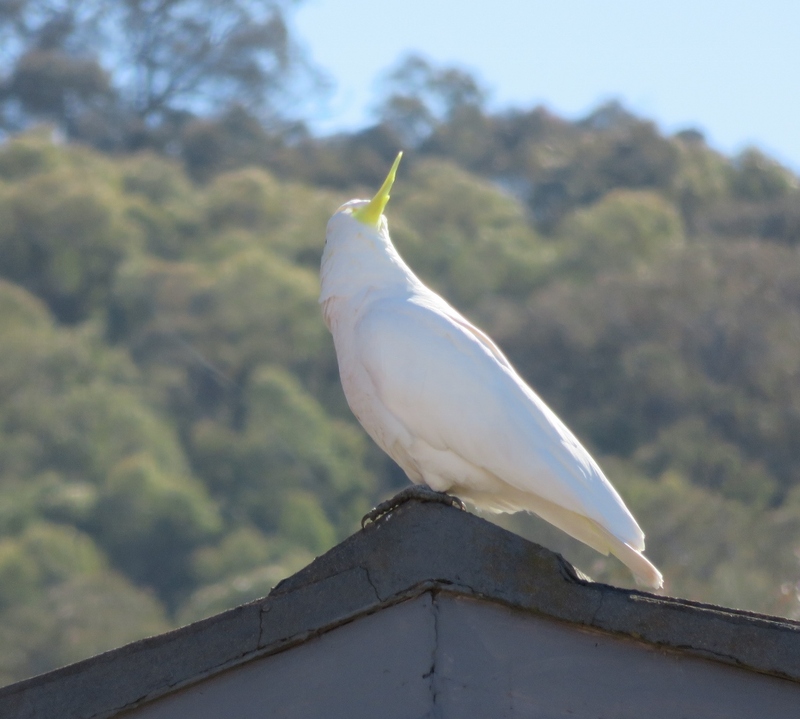 During the summer four more birds will be fitted with trackers to observe their movements here in Australia, and their long return flight. I’ll never complain about the long flight back to Australia again! 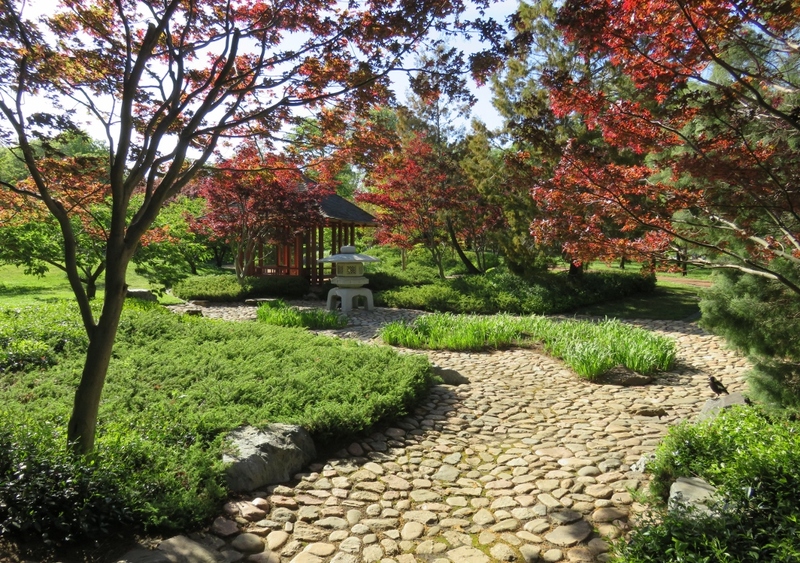 The Nara Peace park is full of colourful trees and blossoms in spring, and shady peaceful places to sit in the hot summer months. 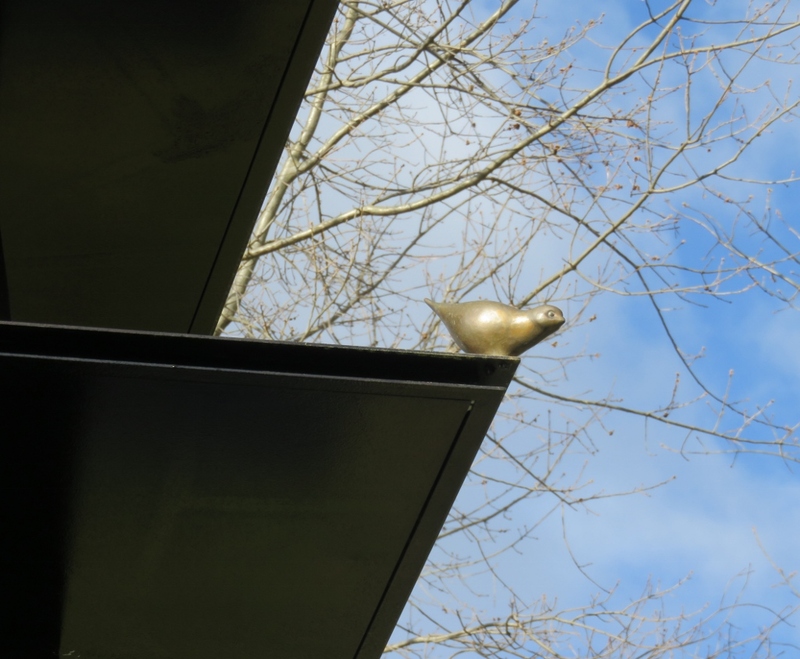 If you are wandering around the park, or just sitting and contemplating the beauty of spring, give a respectful nod to the symbol of the tiny bird near the top of the sculpture, Toku. …. and wish the Latham Snipe well for summer in Canberra. 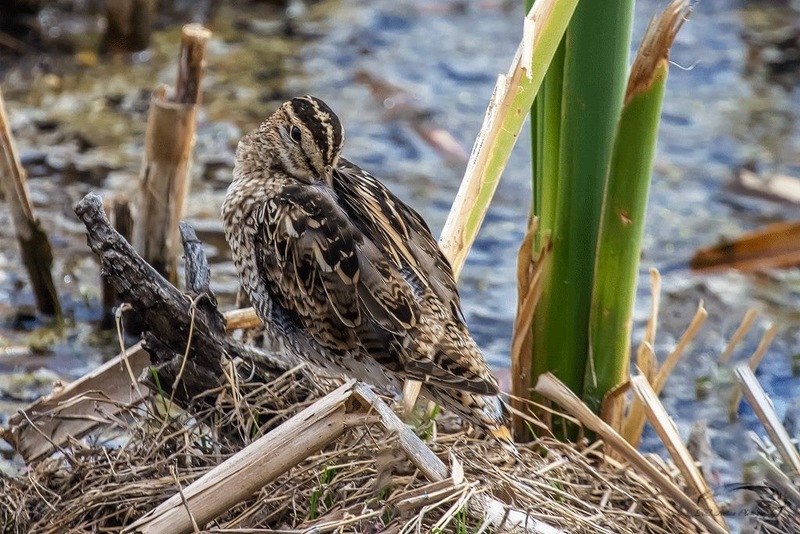 To follow the flight progress of these fearless little birds visit the Jerrabomberra Wetlands site and look for the Latham Snipe project. 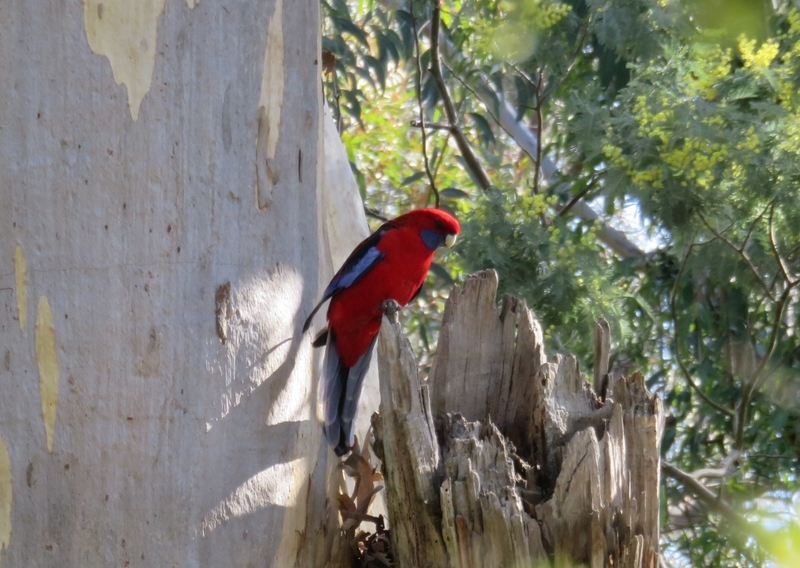 I hope you are enjoying your season and birdlife where ever you are! 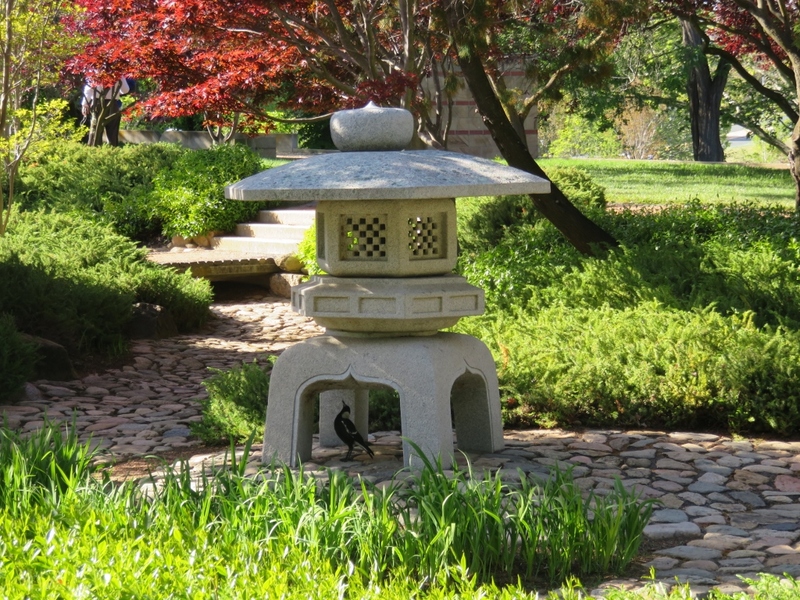 This entry was posted in Canberra's Public Gardens, Wildlife in the suburbs and tagged Australia, Canberra, cherry trees, gazebo, Hokkaido, Japan, Japanese gardens, Latham Snipe project, magpie, Nara, Nara Peace park, Natham Snipe, spring, summer, Toku on November 13, 2016 by germac4. 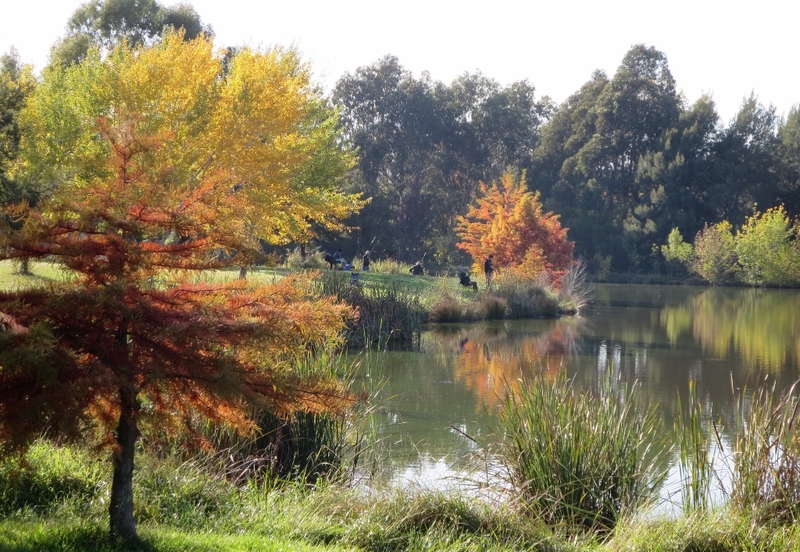 Canberra, as with many young cities, is growing rapidly, and sometimes the rush to build overtakes the need to plan long term….so thank goodness the National Botanic Gardens were planned and planted in the 1960s and it is now in the heart of the city. 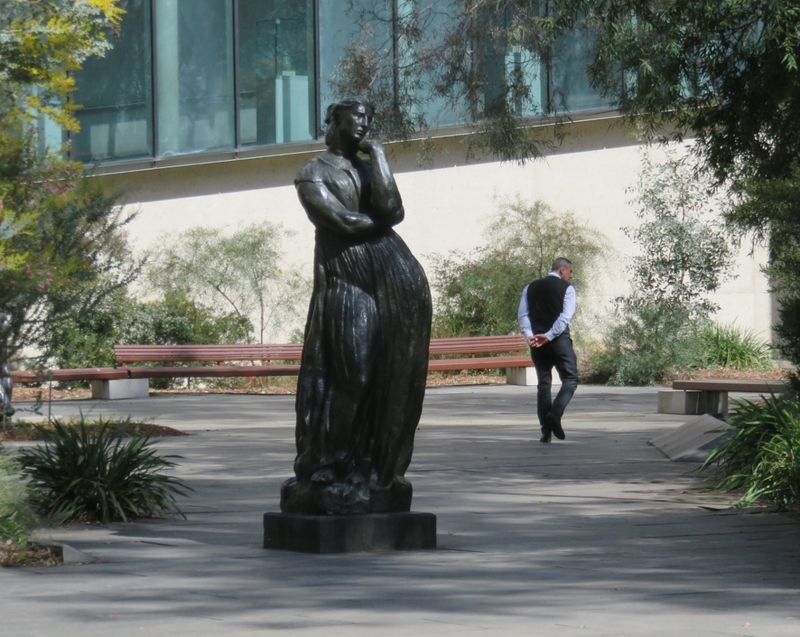 During summer I joined a walking group to re-discover some of the joys of the National Botanic Gardens. 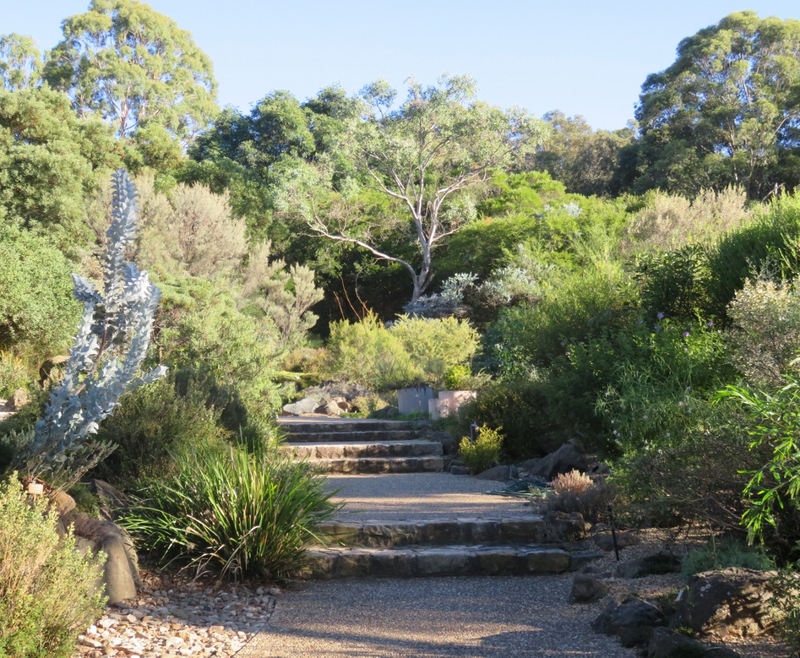 I have written a few posts on some of the diverse parts of the gardens, The Red Centre Garden, and the Rainforest Gully. 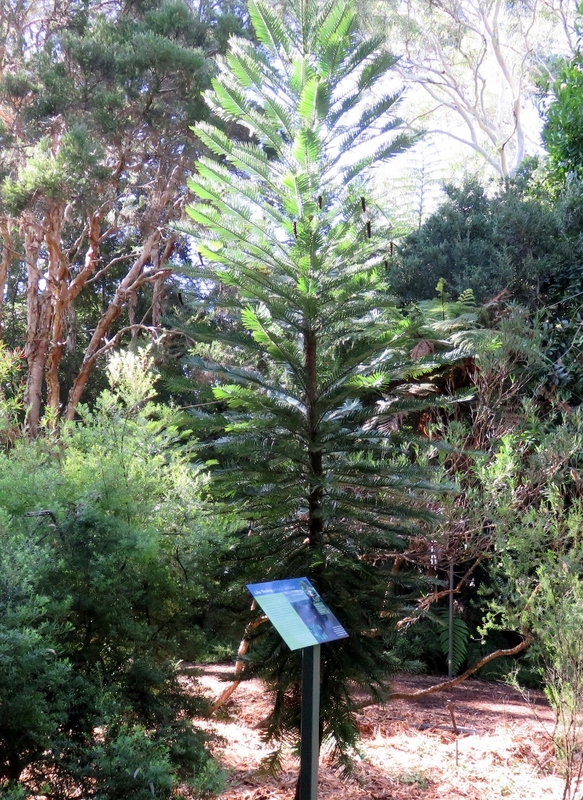 This is the Wollemi Pine, one of the world’s rarest and most ancient tree species. The Wollemi Pine belongs to the 200 million year old Araucariaceae family. It was, until 1994, believed to be extinct. 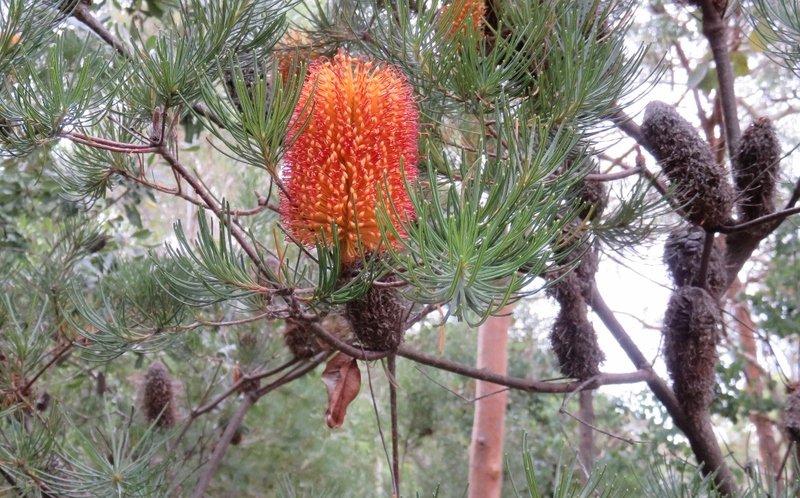 David Noble, a National Parks and Wildlife Officer was bushwalking and abseiling in 1994, and came across an unusual plant in a National Park close to Sydney. 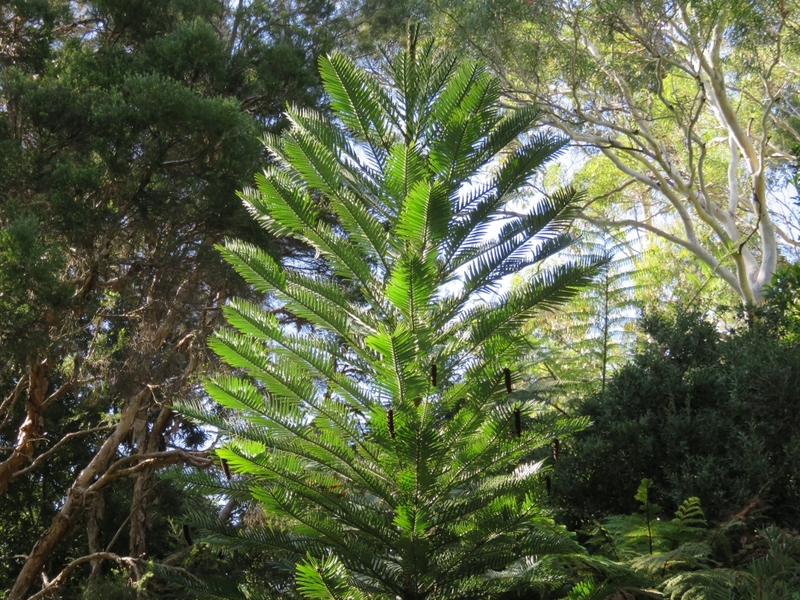 Scientists and Horticulturalists were amazed, as is the general public…because the Wollemi Pine comes from the age of dinosaurs…there are very few left in the wild..
Palaeontologists say it is likely that the dinosaur crossed paths with the Wollemi Pine and may have eaten Wollemi leaves….amazing! 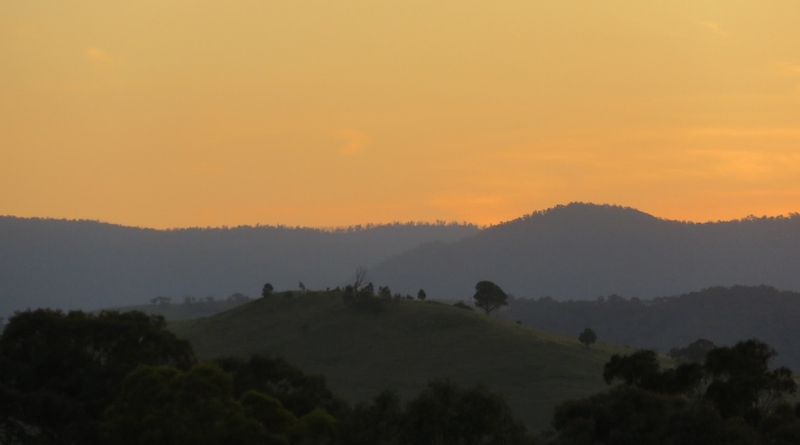 There are a small amount of Wollemi Pines still in the wild, and they are protected, both from human intervention and from fire, to ensure their survival. However, people can now buy and grow a Wollemi Pine (if you have a very large garden!) and become part of one of the most dramatic comebacks in natural history. 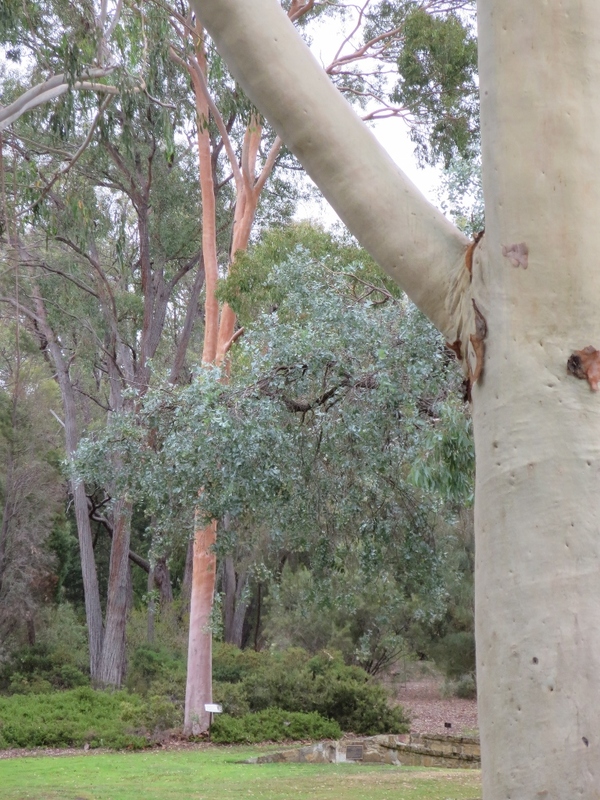 The trees that do dominate the landscape of the Gardens are the Eucalypts. 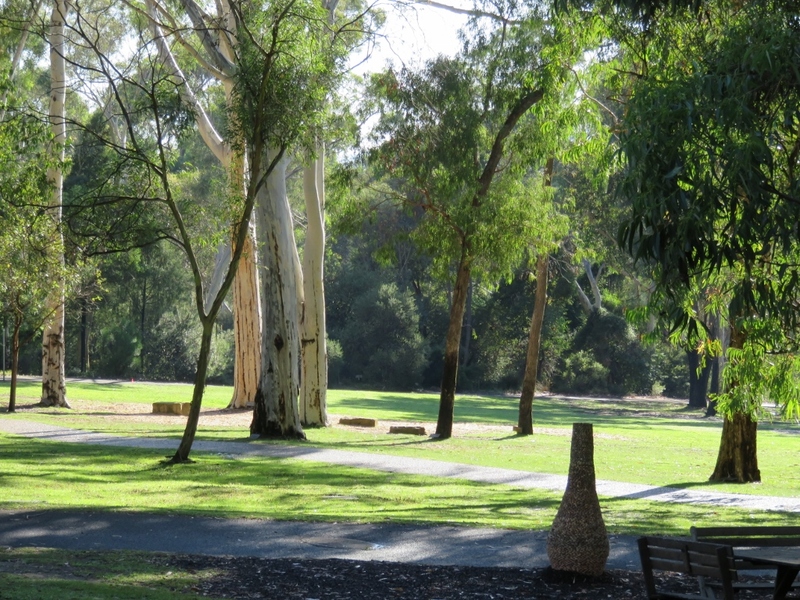 In summer visitors enjoy concerts under the trees, children come for ”Eucalyptus by Gum” educational adventure, couples get married, groups meet to have picnics. 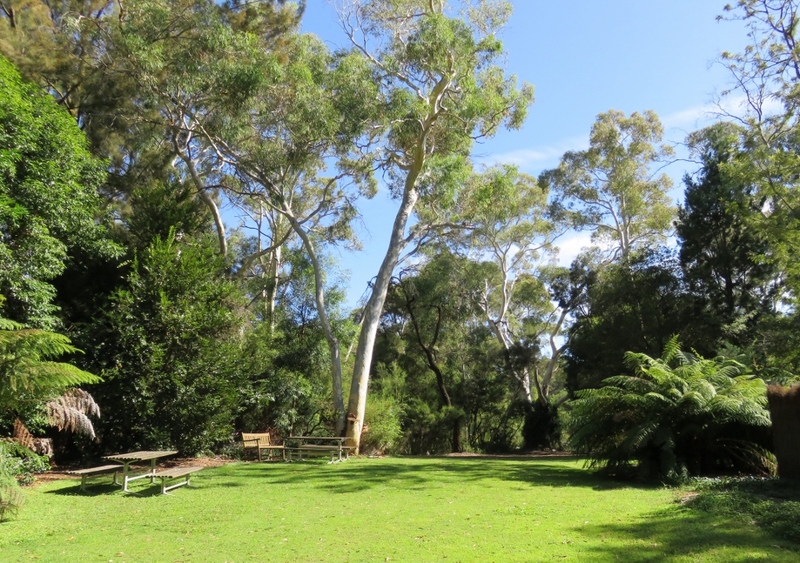 There are more than one hundred species to be seen if you wander across the Eucalypt lawn. 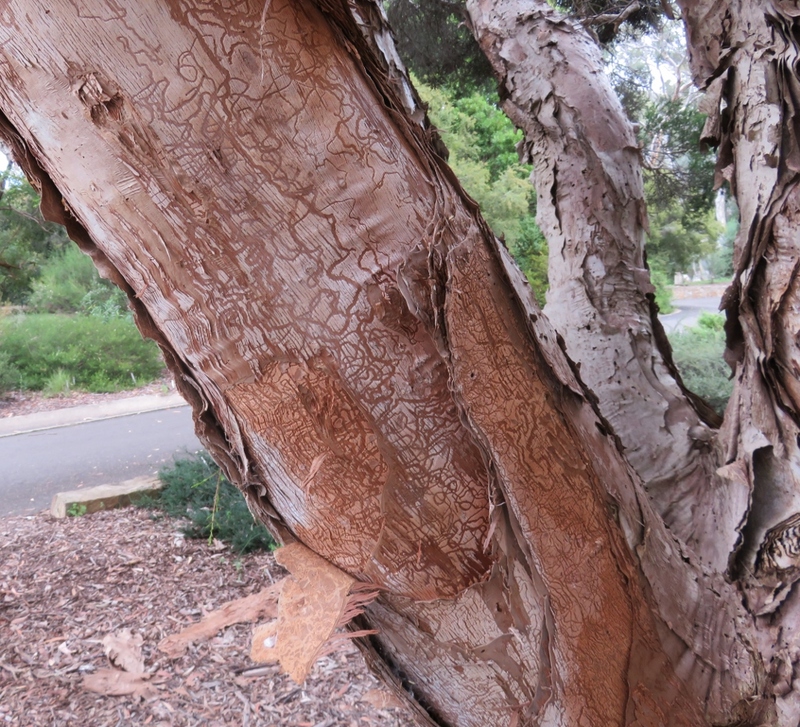 The tree below is called a Smooth-barked Apple…it is eye catching and smooth as silk to feel.. 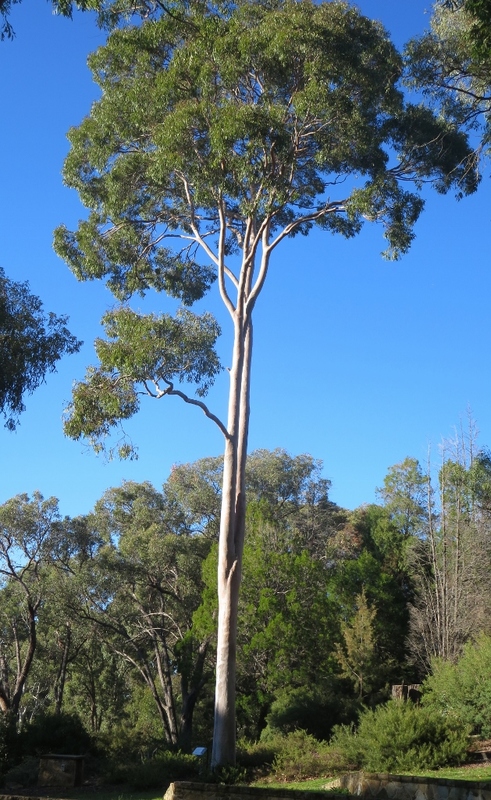 It was one of the earliest Eucalypts collected by Europeans, Joseph Banks and Daniel Solander who travelled with Captain Cook in 1770. 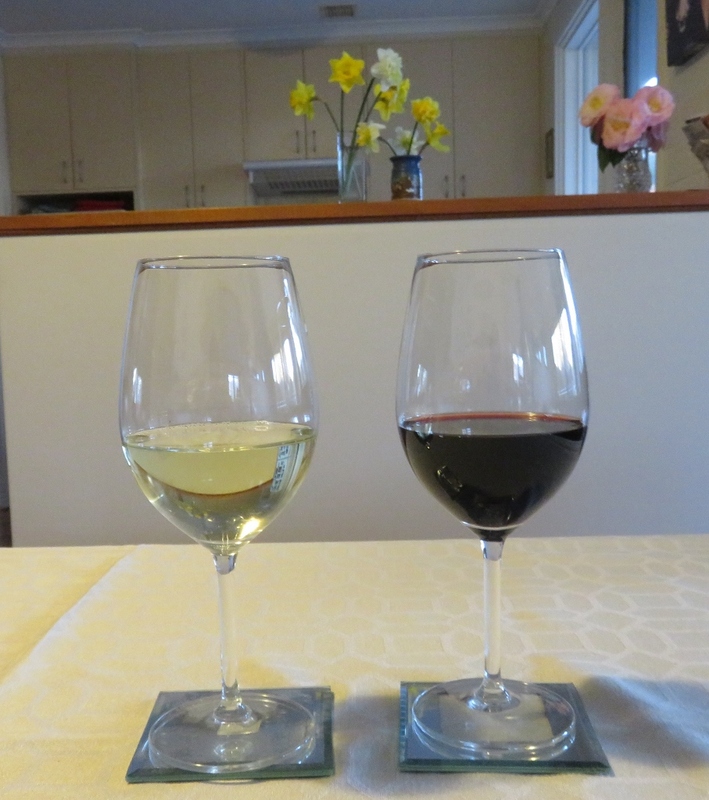 It is quite easy to see why they wanted to take a sample home. 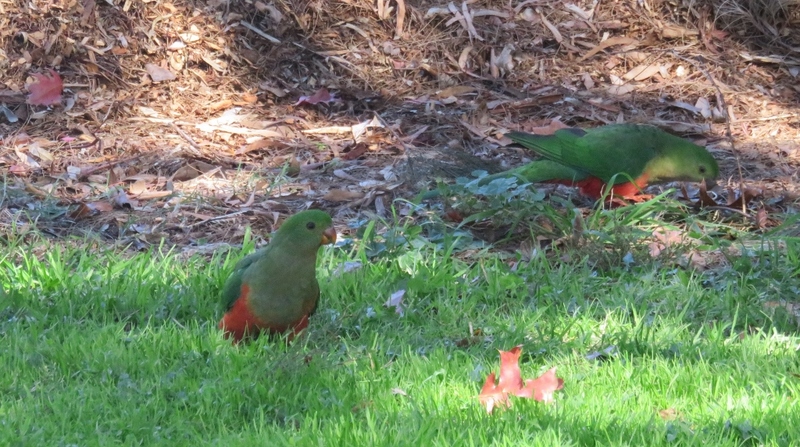 The Gardens are also the perfect place for photography enthusiasts …..
…where else would you see King Parrots looking so beguiling…. 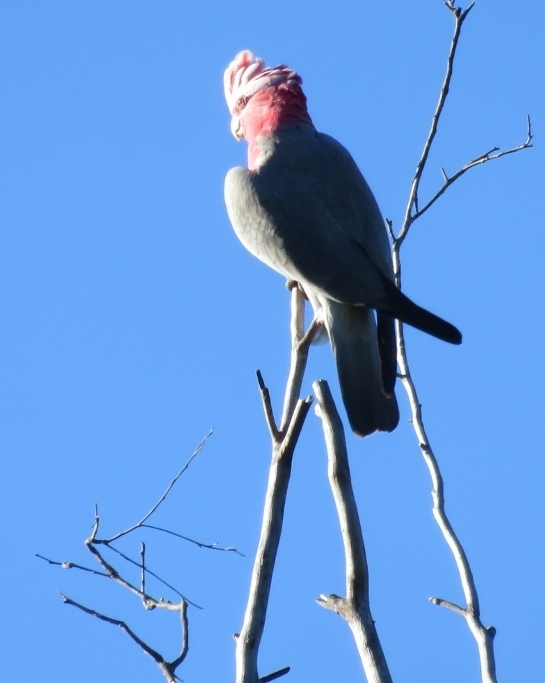 This shy New Holland Honey Eater is darting between the banksias….hard to catch..
And here is another well known Aussie, a Galah, perched on top of the highest point of the highest tree… oh to be a bird….. 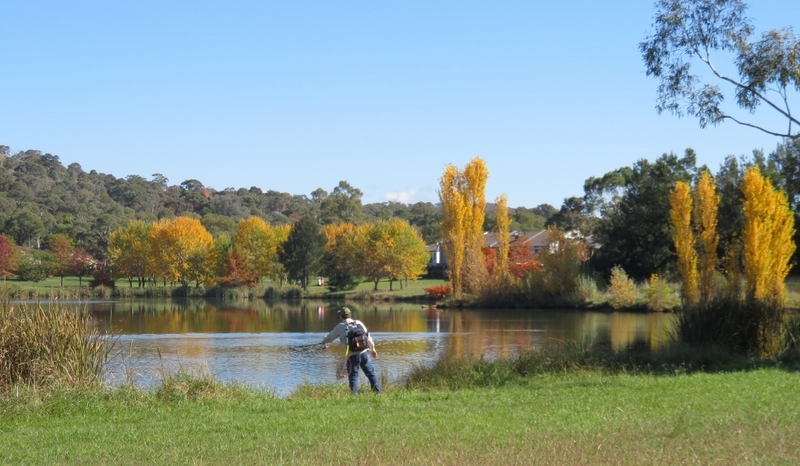 Autumn is a wonderful season in Canberra, and I hope to write a few more posts about my home town before winter begins! 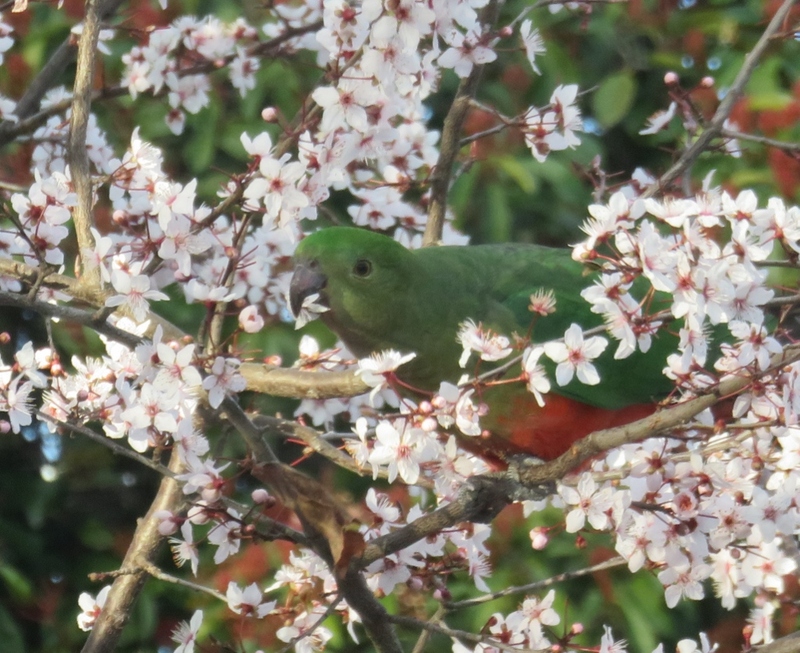 This entry was posted in Canberra's Public Gardens and tagged ancient, Australia, Banksias, birds, Canberra, dinosaur, Eucalypts, extinct, Galah, King Parrot, National Botanic Gardens, New Holland Honey eater, Rainforest Gully, Red Centre Garden, Smooth-barked Apple, trees, Wollemi Pines on April 2, 2016 by germac4.